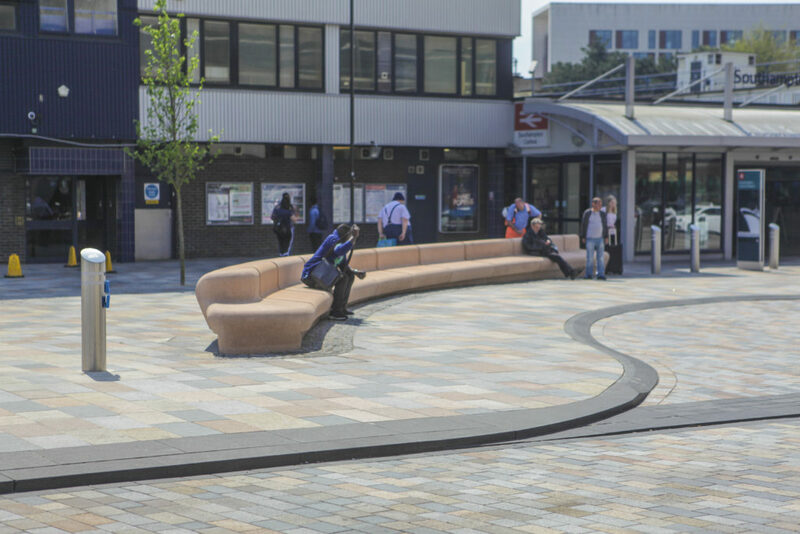 Southampton Station Quarter North was shortlisted for the 2016 Solent Design Awards, which were awarded in November 2016 – A much needed update on the project. 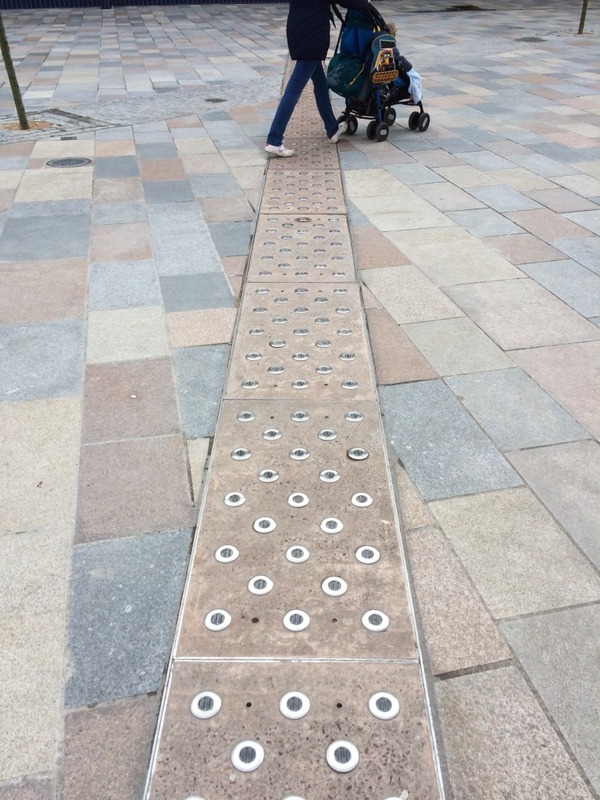 Better late than never ! 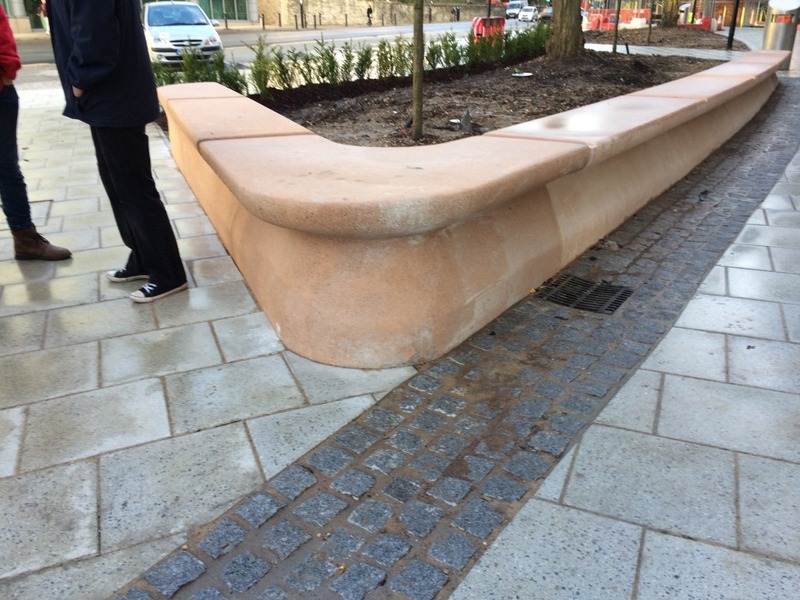 Although our project was not one of the winners… it was very encouraging that the collaborative approach which delivered the project and the role of our Champions Group, which endured throughout the build programme was recognised via the shortlist process. 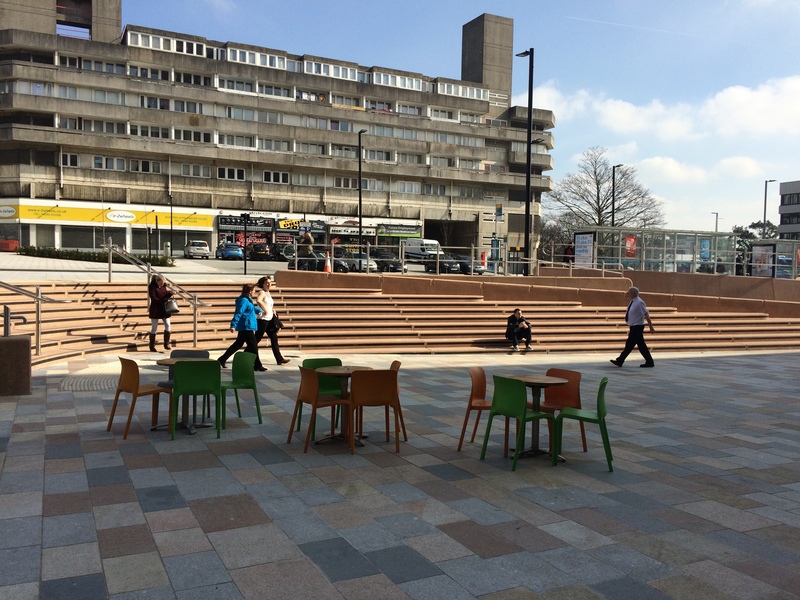 ‘The Solent Design Awards are all about the encouragement of quality place-making; schemes that create special places, lift communities, create richer experiences … not just iconic buildings, but also the places in-between’. 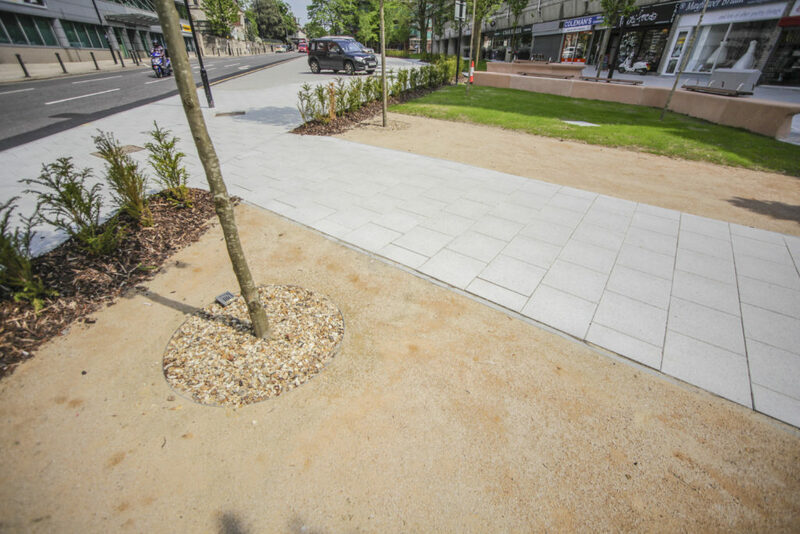 The following set of images from the site were produced by Wilson Massie of Balfour Beatty Living Places – thanks Wilson ! 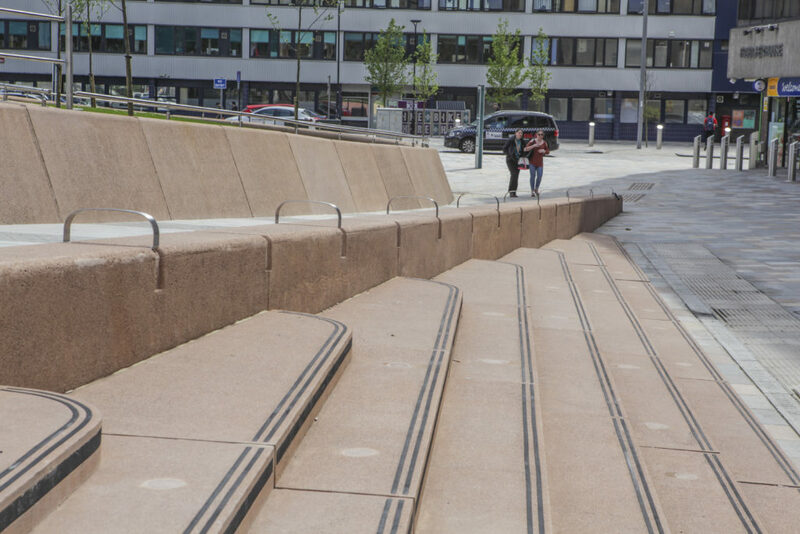 The artwork ‘Canal Shore’ runs for almost 200m along the South side of Blechynden Terrace. 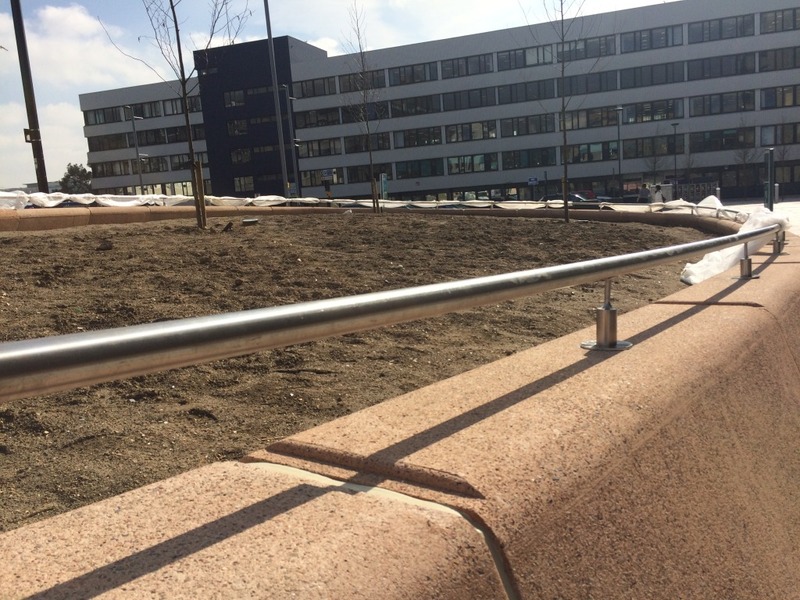 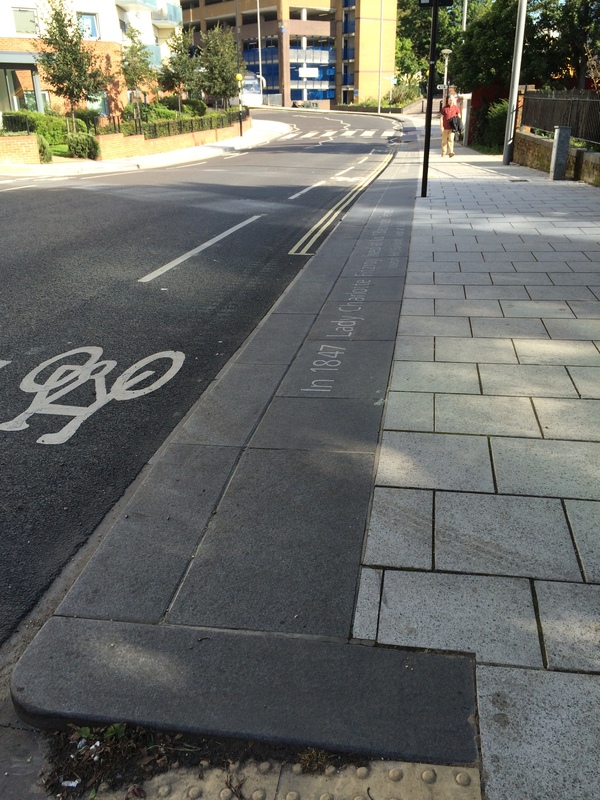 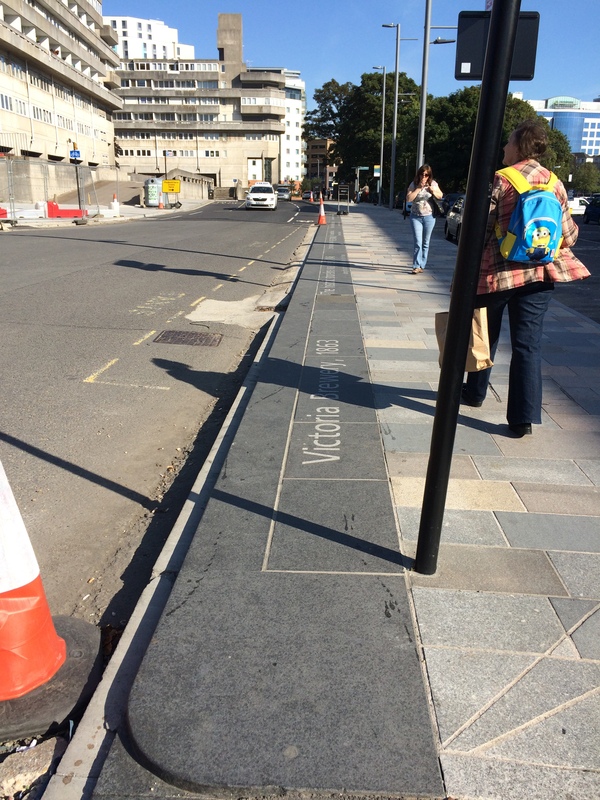 Bespoke extra wide Black Basalt kerbs are inset with white granite text referencing the site. 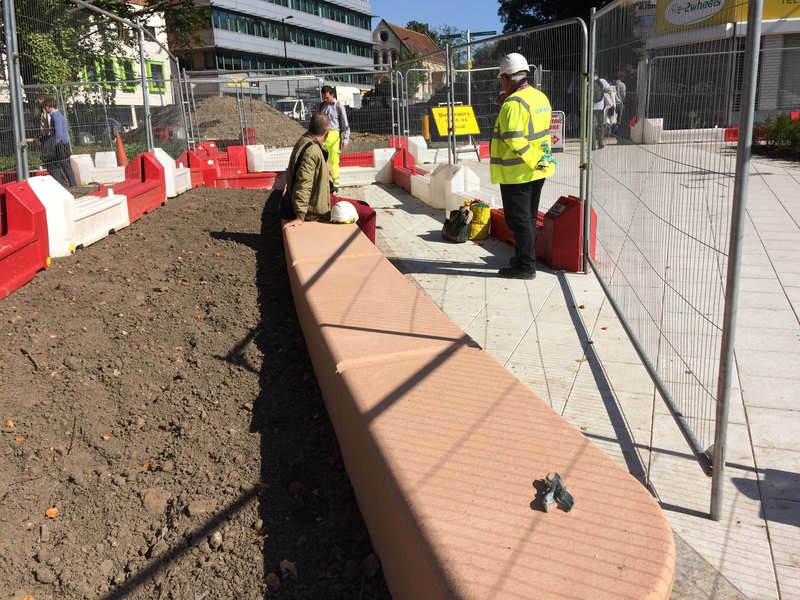 With thanks to Hardscape for their excellent collaboration on the ‘Canal Shore’ artwork. 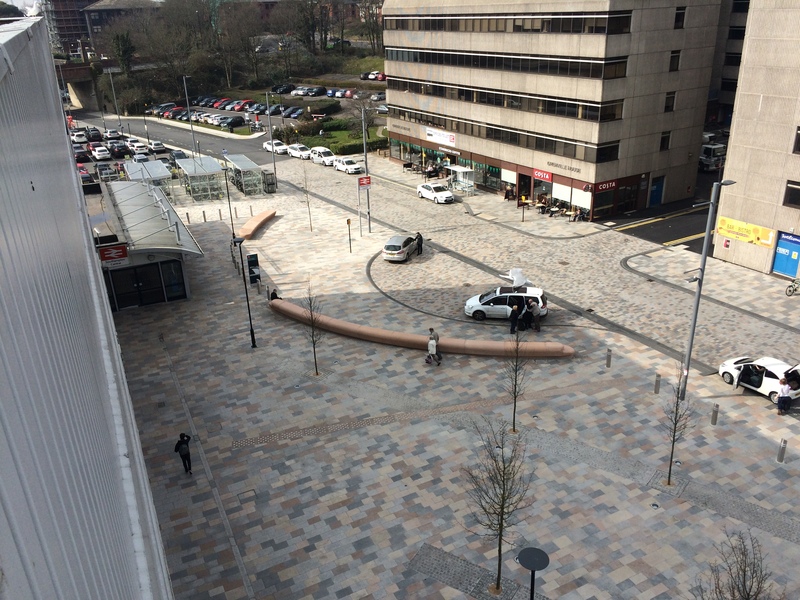 I have to admit that this is the first time I have been inside the multi storey car park at the junction of West Park Road and Kingsbridge Lane. 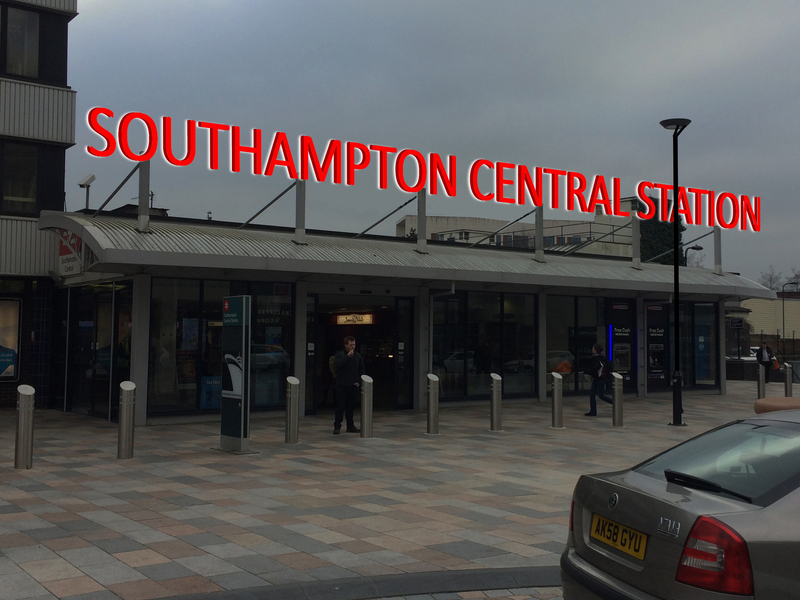 The first time in over 12 years coming to Southampton. 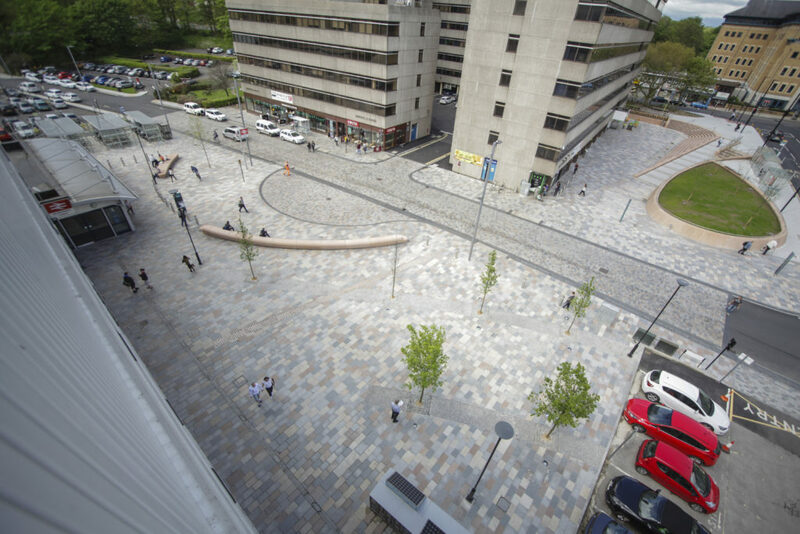 What a good view down Blechynden Terrace ! 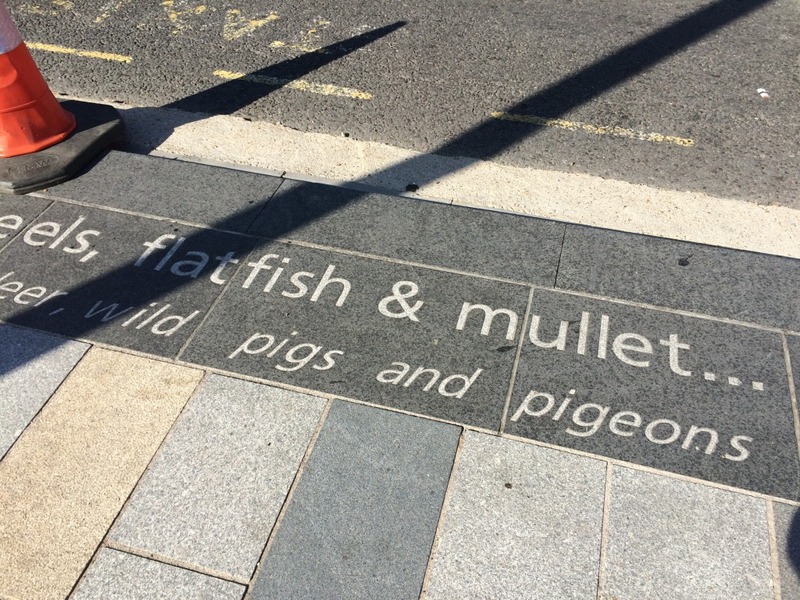 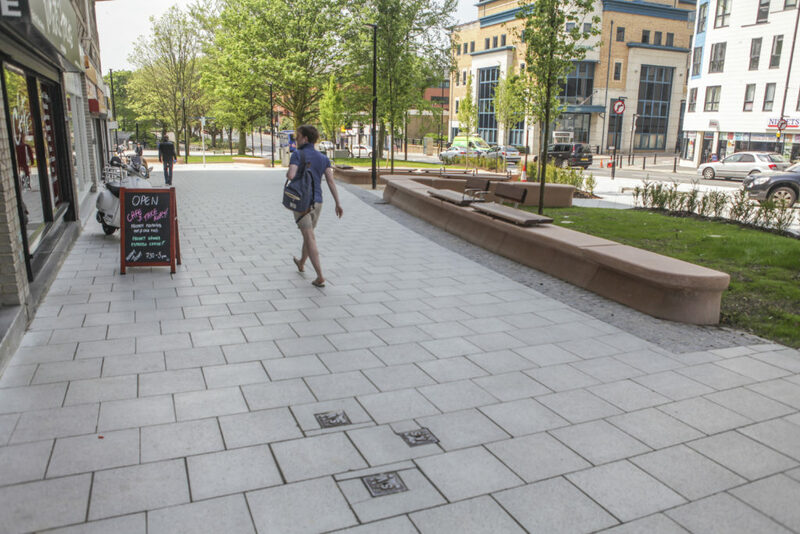 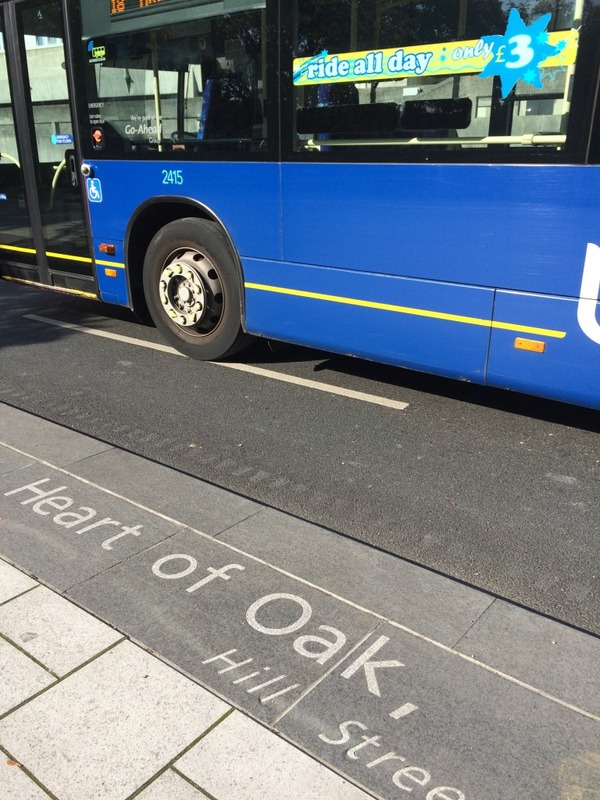 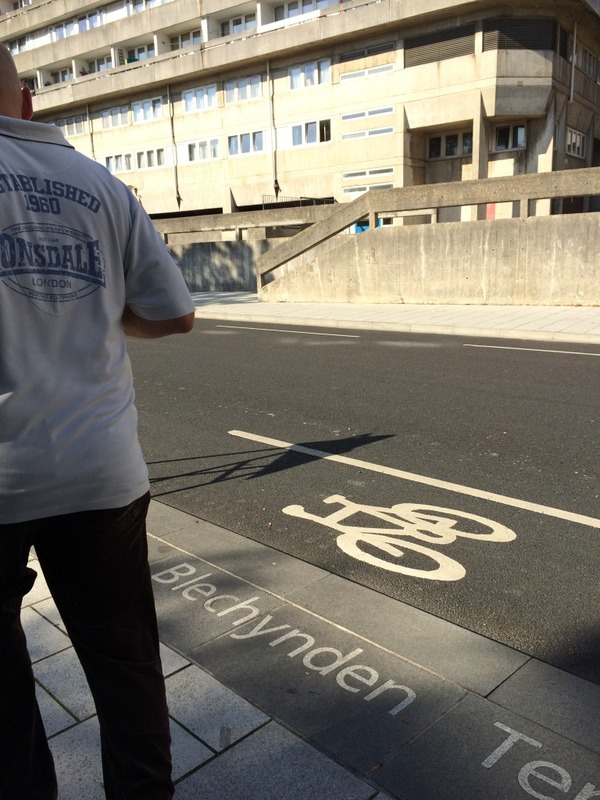 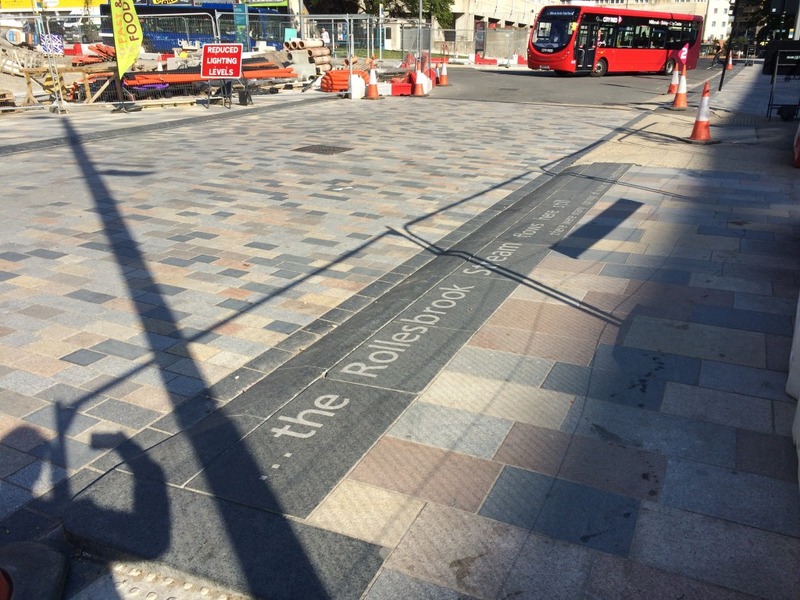 The main pedestrian routes on the north and south sides have been re-surfaced and the public artwork “Canal Shore’, a 205m long wide basalt kerb detail with inlaid granite text, forms a strong and robust visual desire line on the south side of Blechynden Terrace all the way to the Station Forecourt. 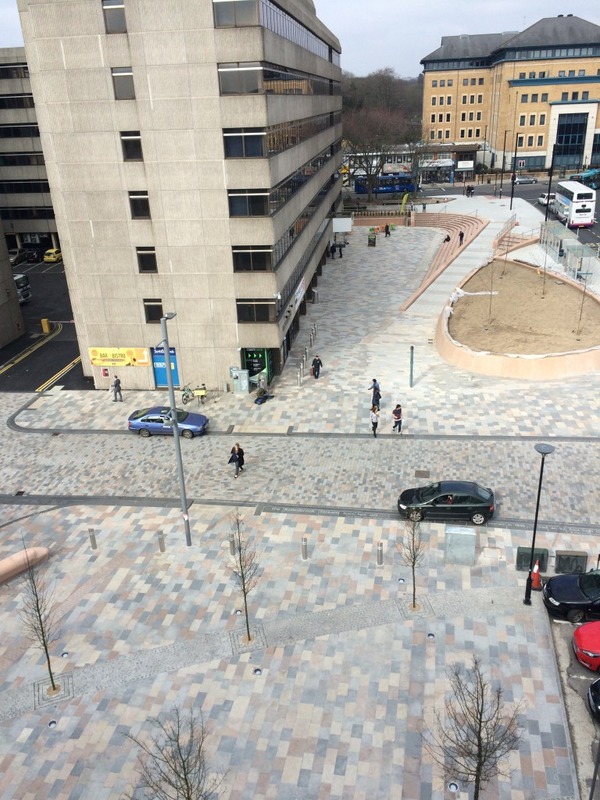 The footpath just visible at the bottom left corner of this image is the start of Kingsbridge Lane, which is the main pedestrian route from the Station to the City Centre and Cultural Quarter. This route is very well trafficked and very busy at peak times, with a flow of people at all times of day. 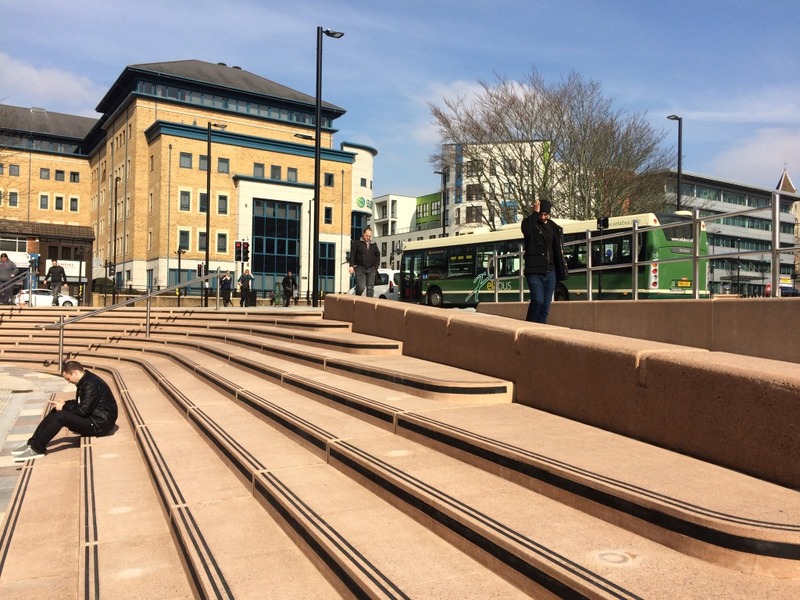 The visual and physical connection to the Station Quarter Project is currently poor and we are now scoping this route to consider an approach to regenerating the site and improving connectivity and user experience. 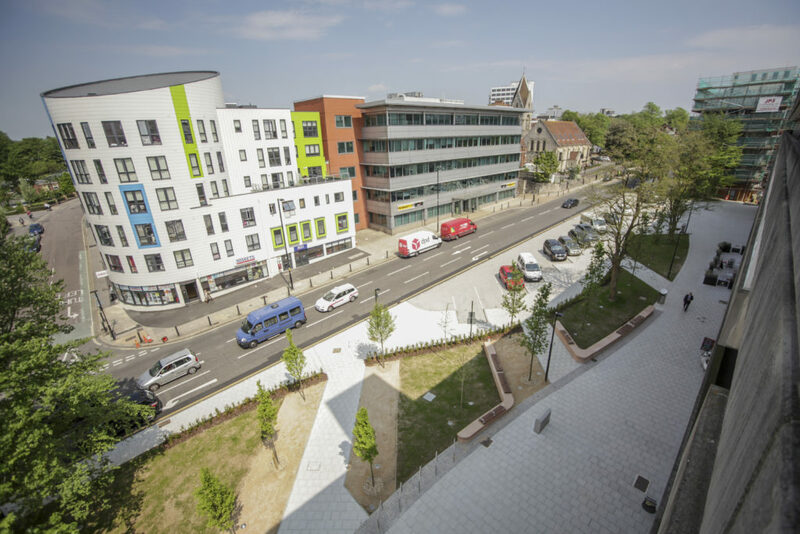 Very much earlier in the project – back in 2012 – one of the Urban Design consultants on the project – I think from Urban Initiatives – managed to get access to the roof of Overline House, which sits adjacent to the train lines and overlooks our site. 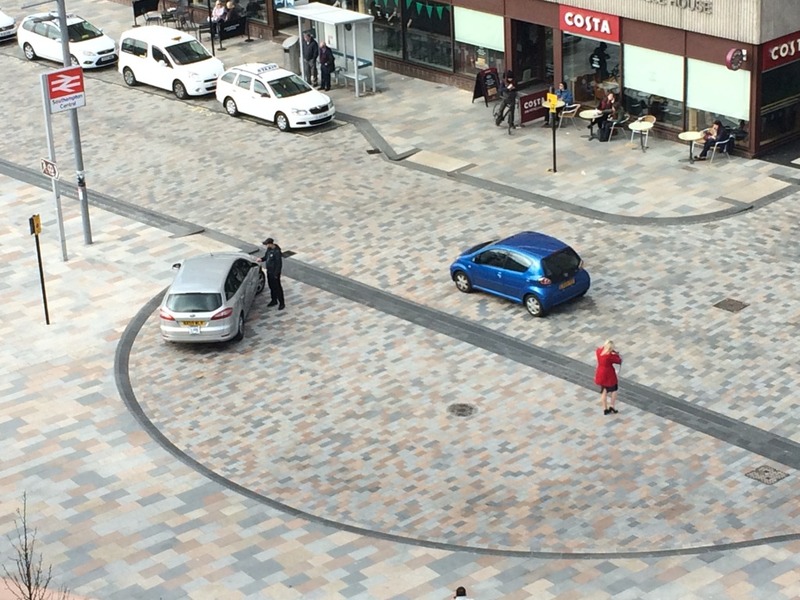 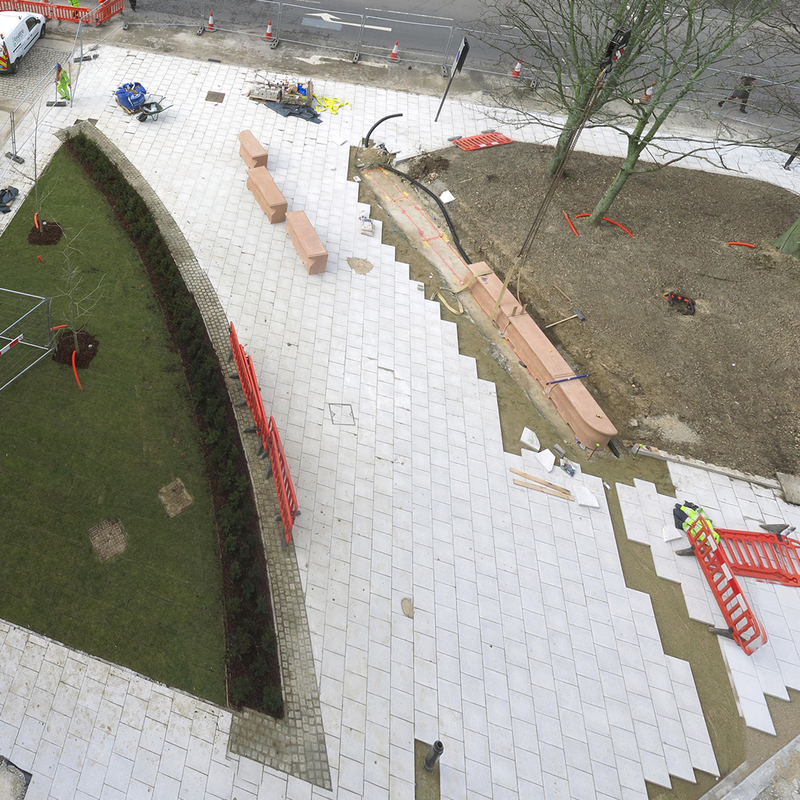 This image is seen below – along with another taken this week from a similar vantage point on the roof. 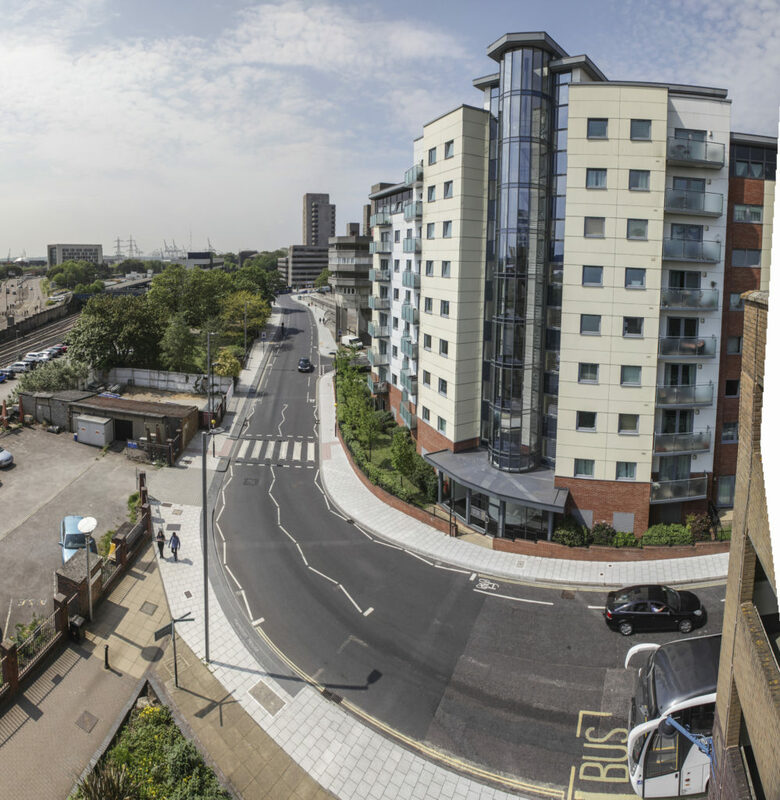 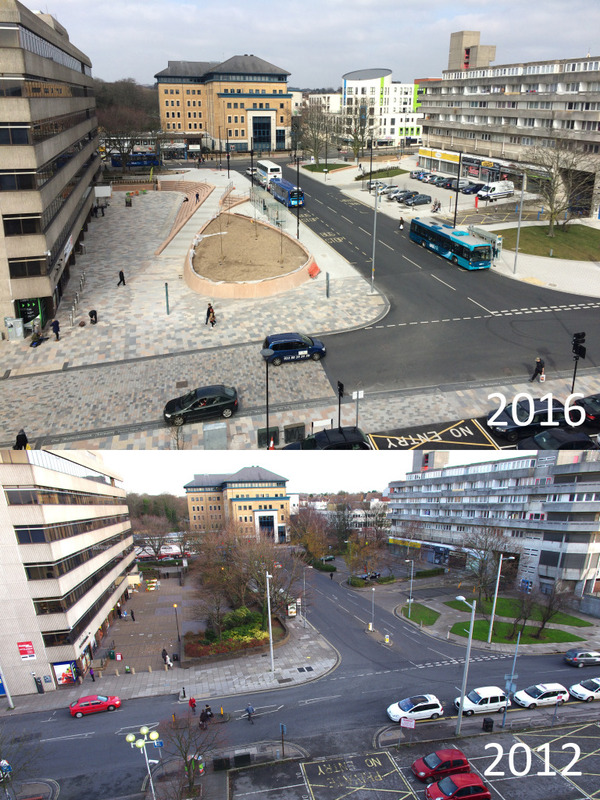 A section of Southampton Station Quarter North Project on Wyndham Place as seen from the roof of Overline House on Blechynden Terrace in 2016 & 2012. 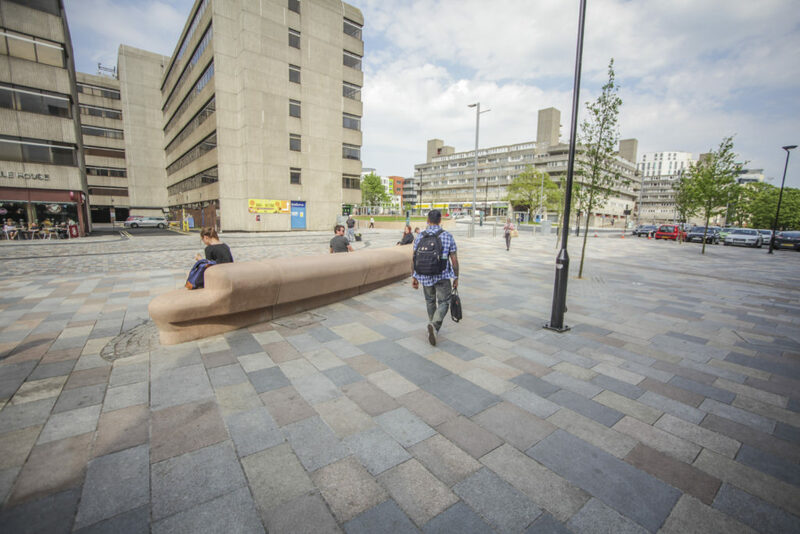 2016 Image by Project Artist Christopher Tipping. 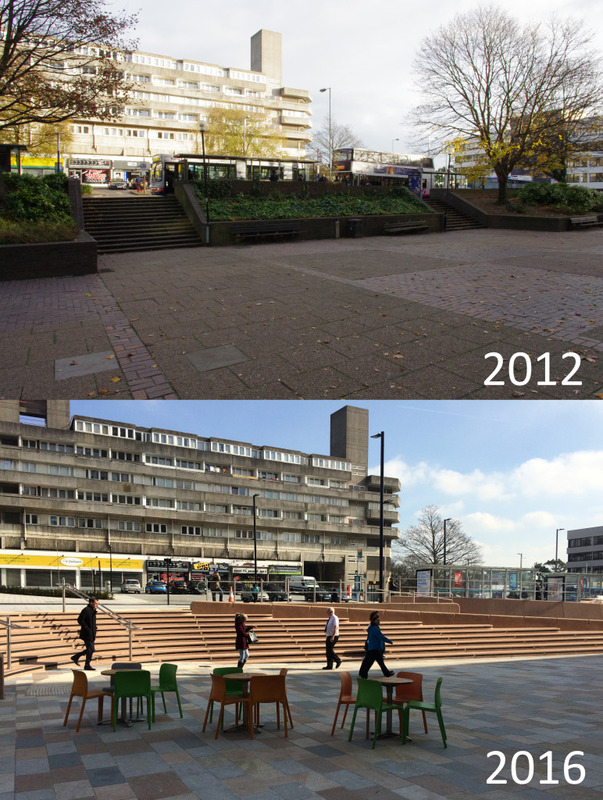 2012 Image by Urban Initiatives. 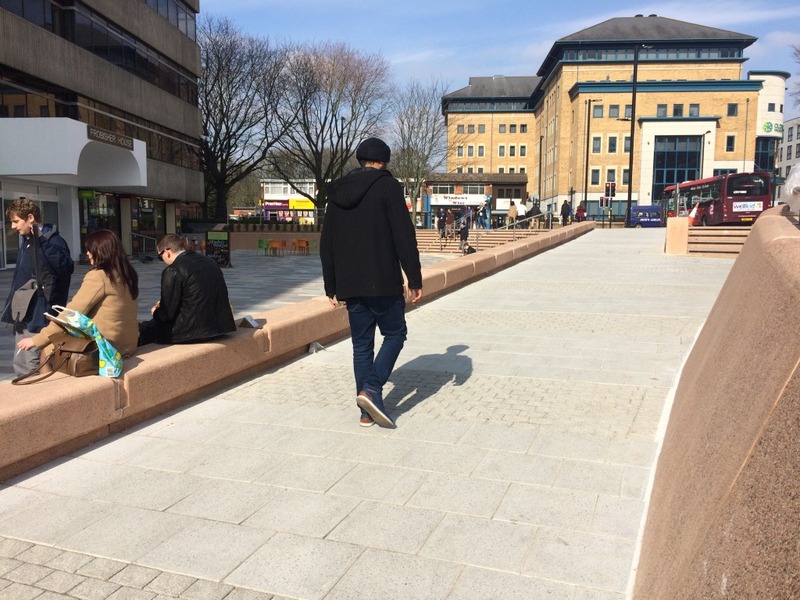 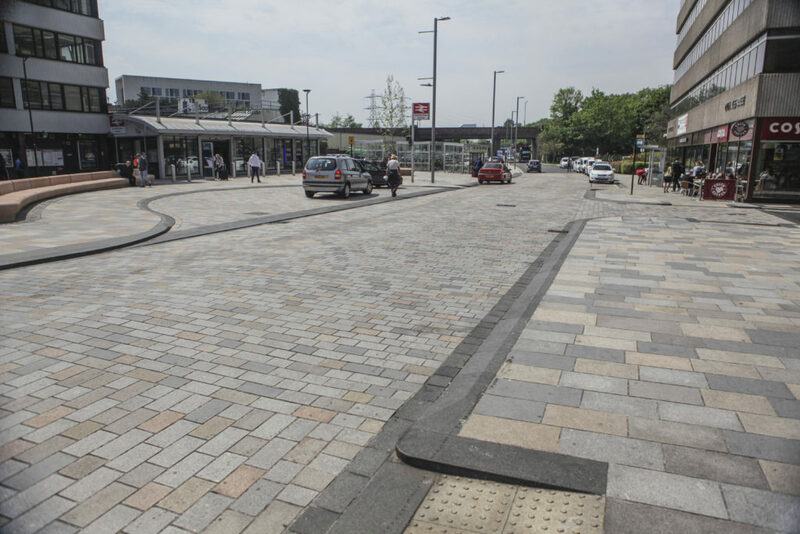 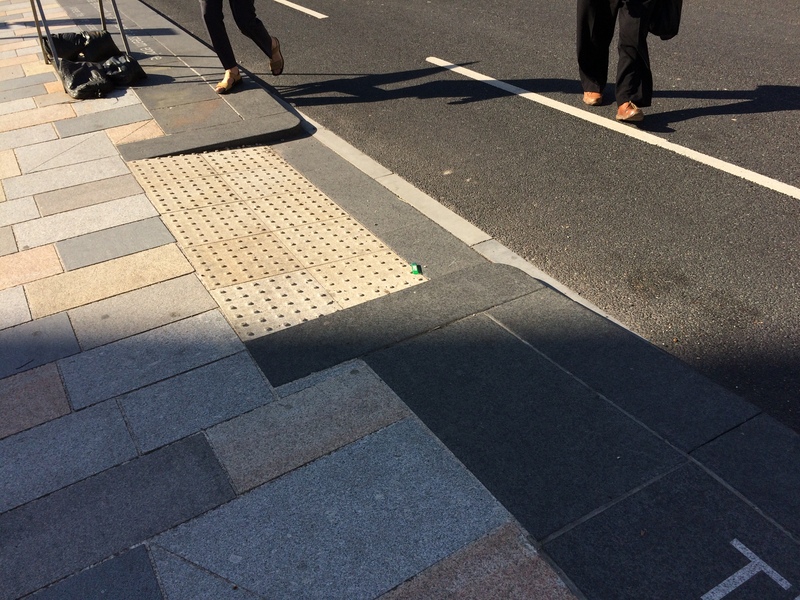 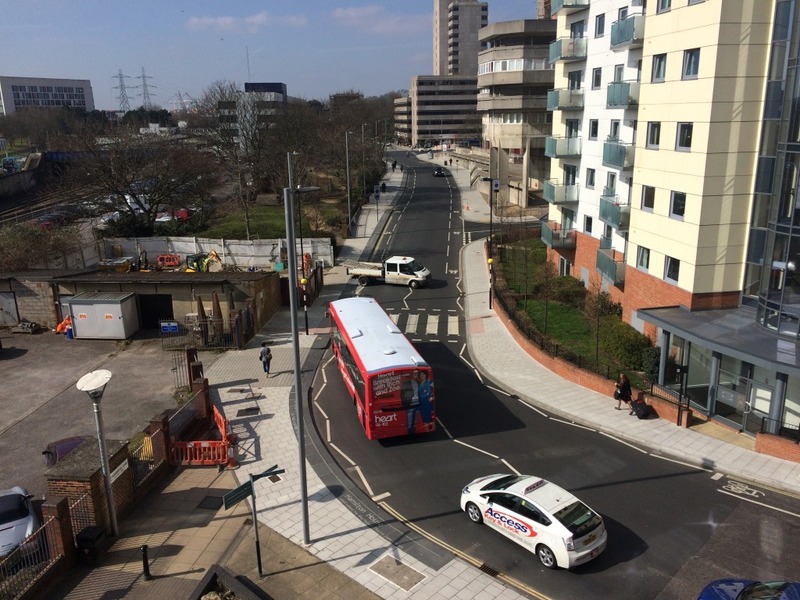 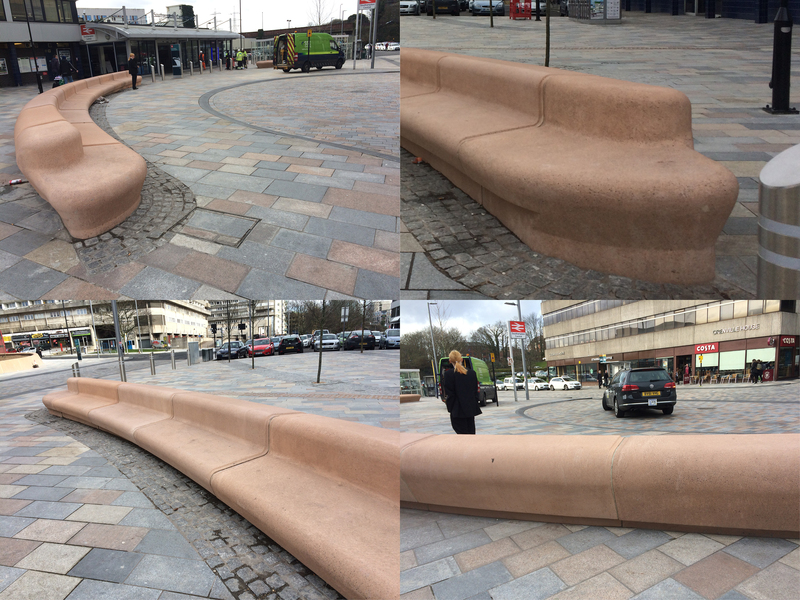 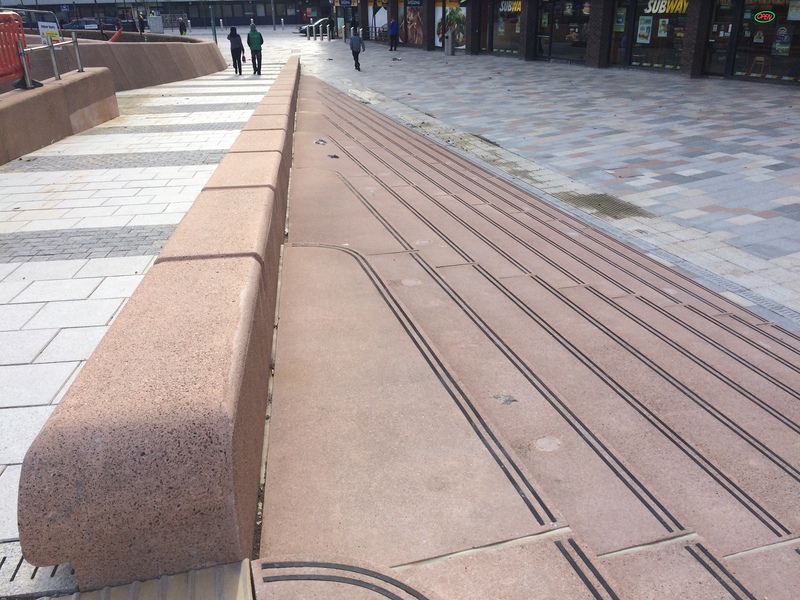 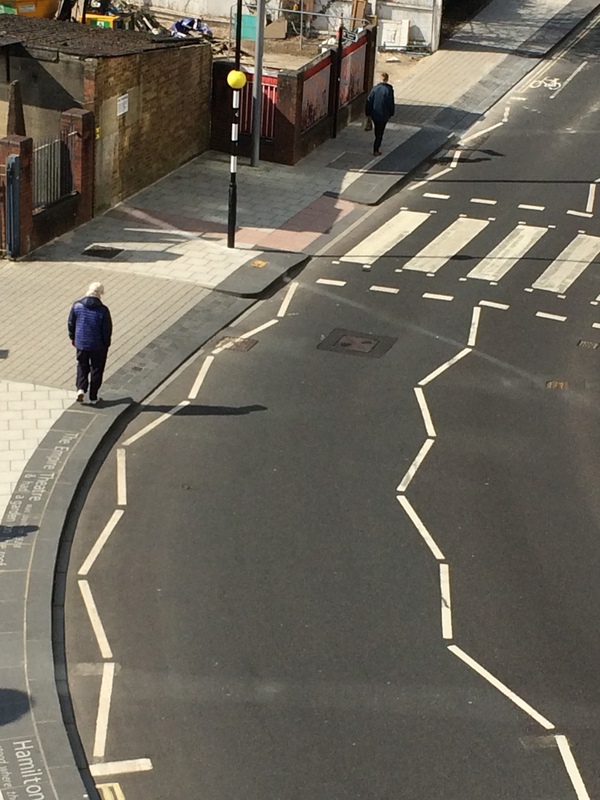 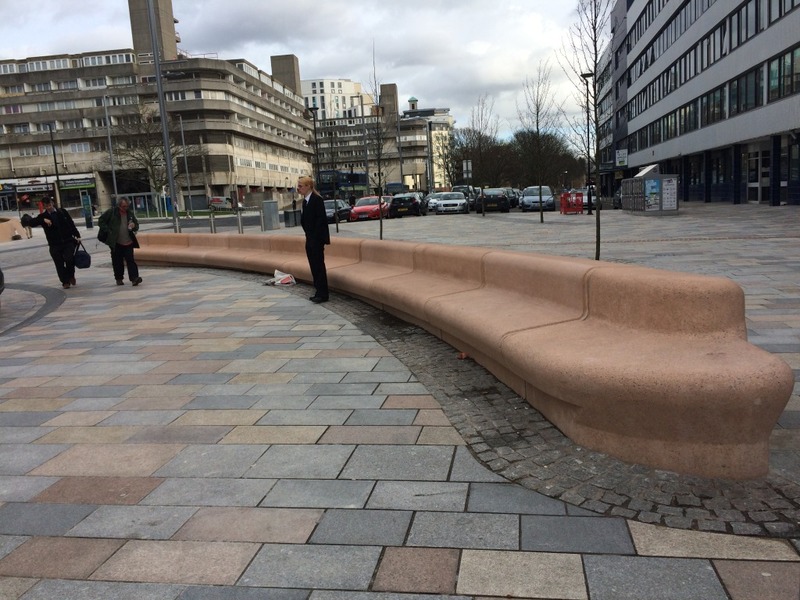 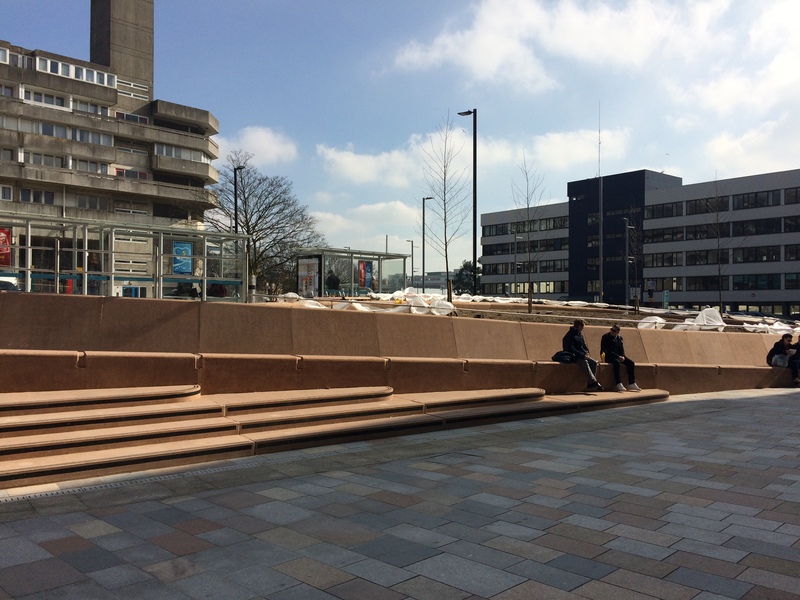 I spent March 15th in Southampton on a site visit to scope out an extension of our current Station Quarter Project to include Kingsbridge Lane – which is a vital pedestrian route to and from the Station, City Centre and Cultural Quarter. 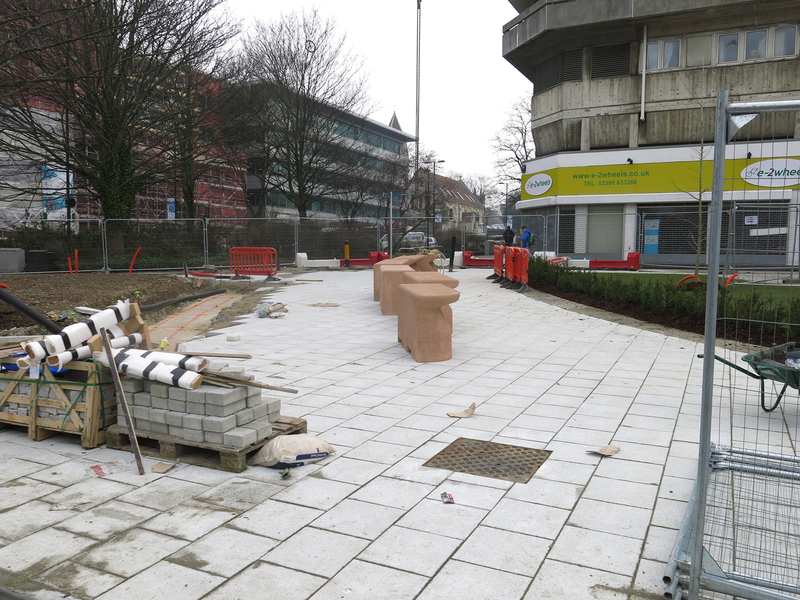 I am working again in collaboration with Balfour Beatty Living Places for the client Southampton City Council. 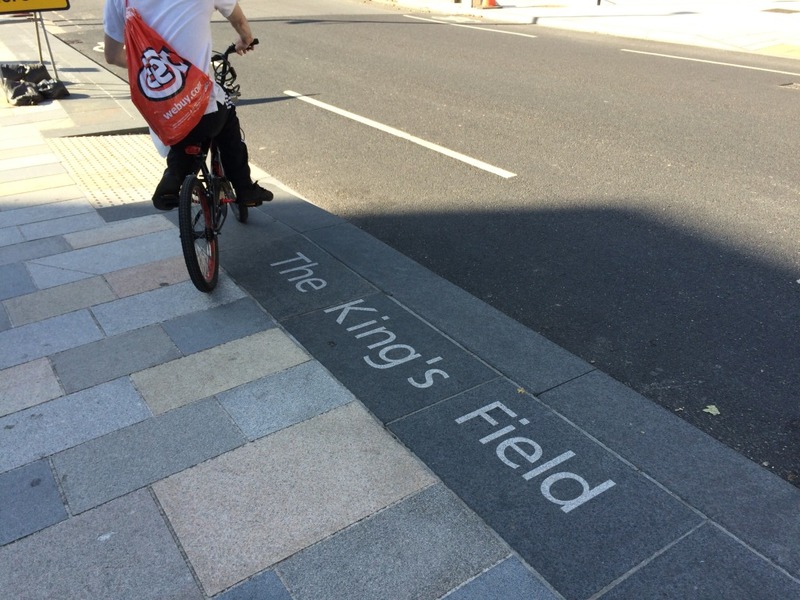 Kingsbridge Lane will be a separate storyline on the blog. 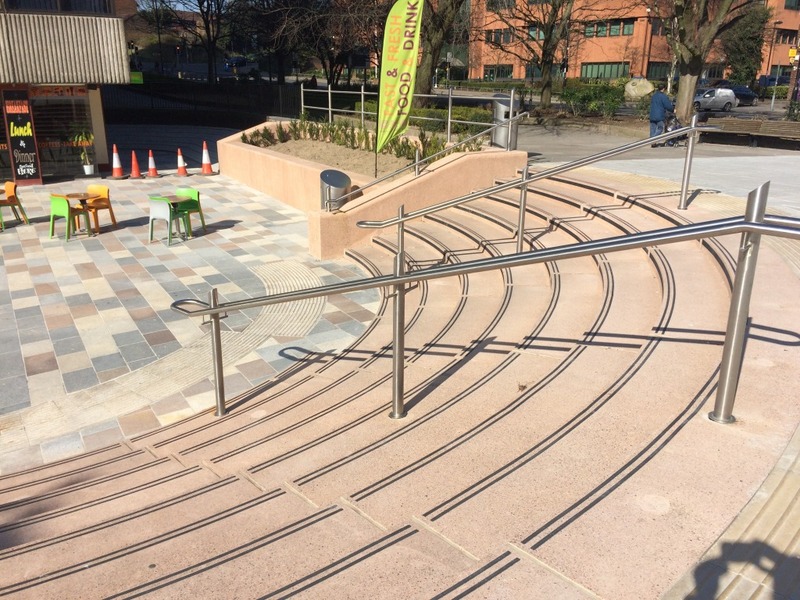 Look our for that ! 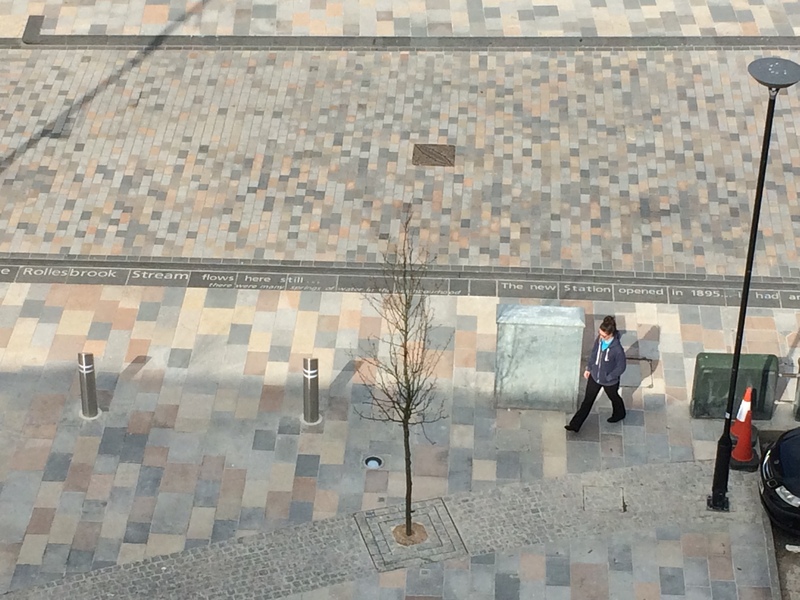 Couldn’t resist the opportunity to take more images of the Station Quarter Project, now that it is nearing completion. 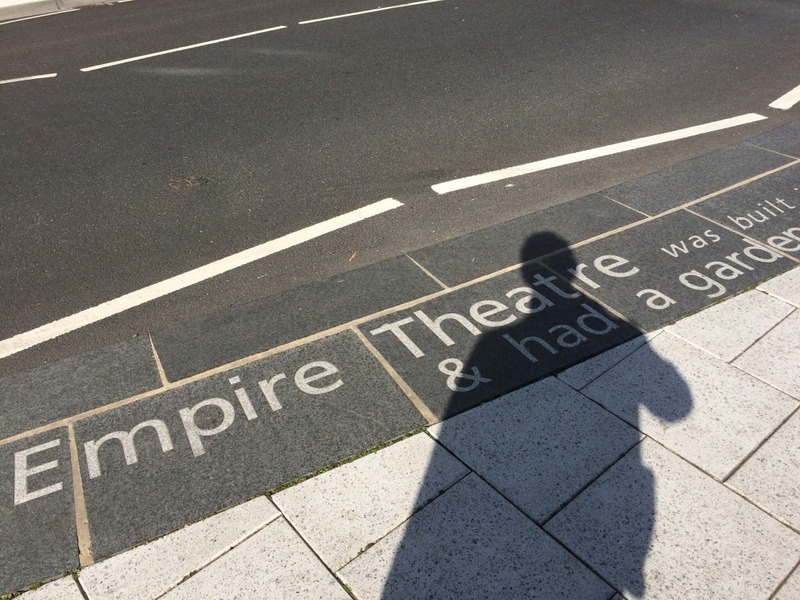 I was last in Southampton on Tuesday 9th February. 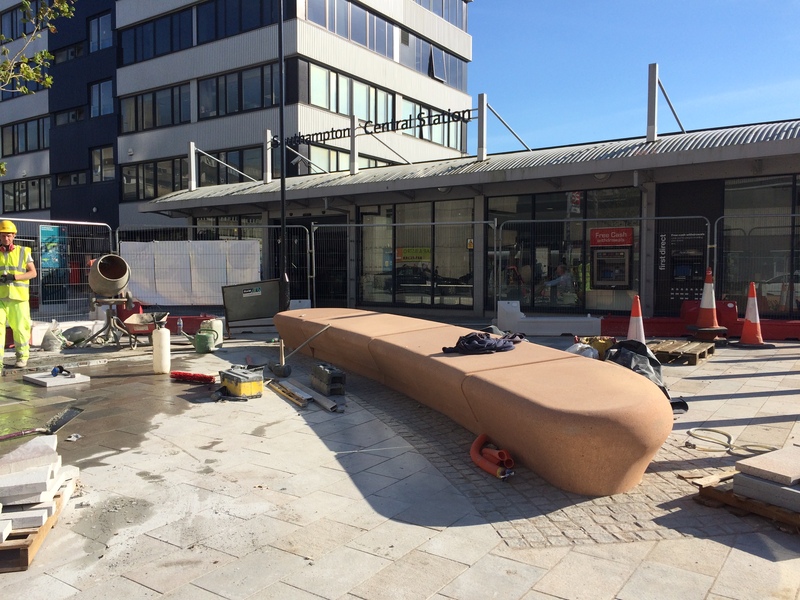 Not a massive difference in the work, although it has definitely moved on – but the weather yesterday was a whole lot nicer – blue sky and great light – perfect chance. 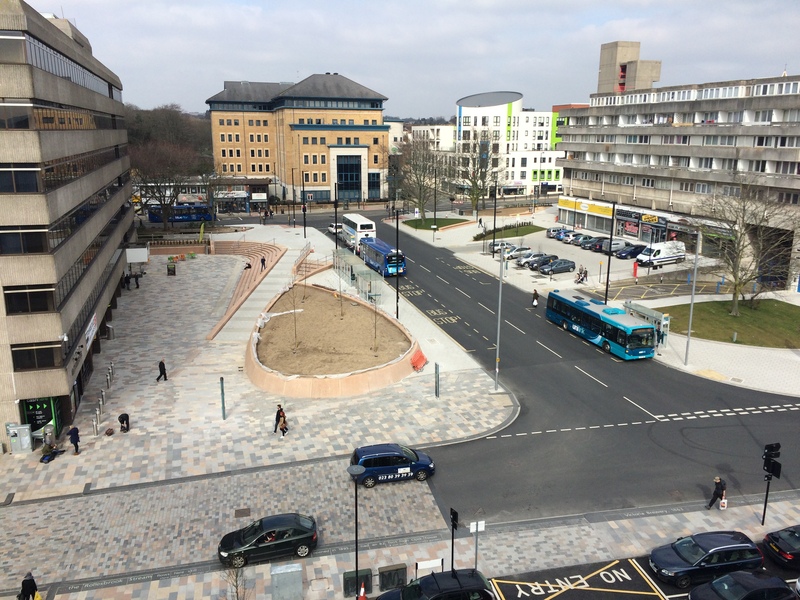 A section of the Southampton Station Quarter North Project, Wyndham Place as seen from outside Caffexpresso, Frobisher House in 2016. 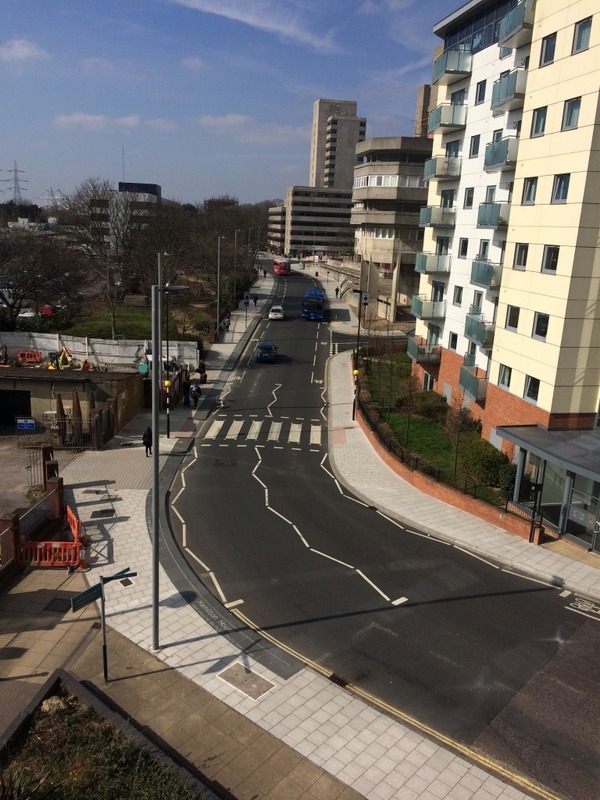 The same view is shown in 2012. 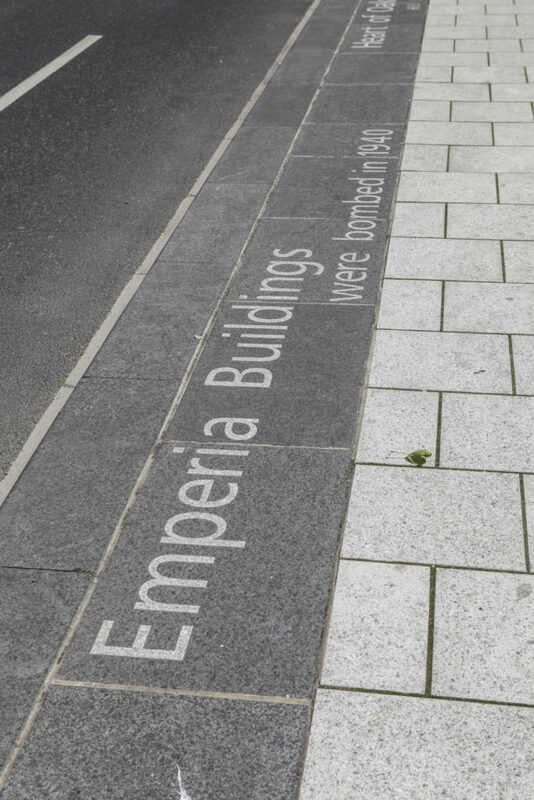 2016 Image by Project Artist Christopher Tipping. 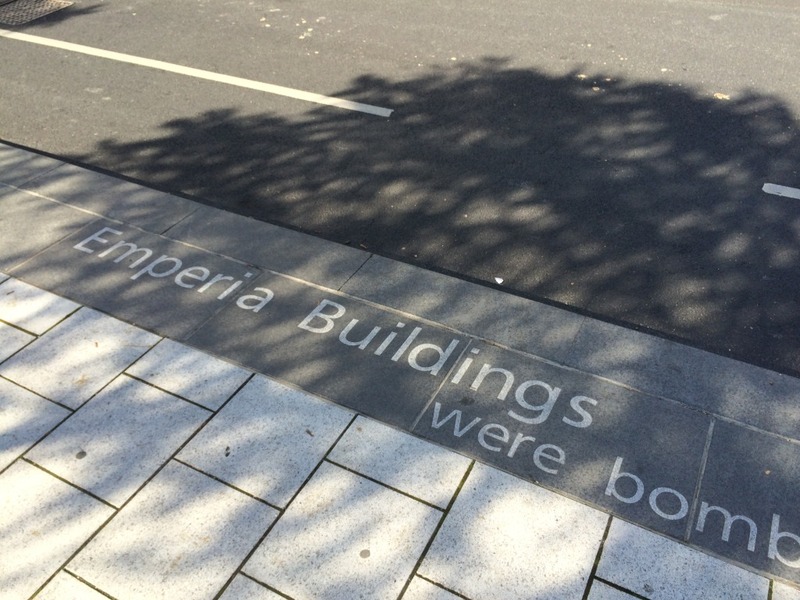 2012 Image by Urban Initiatives. 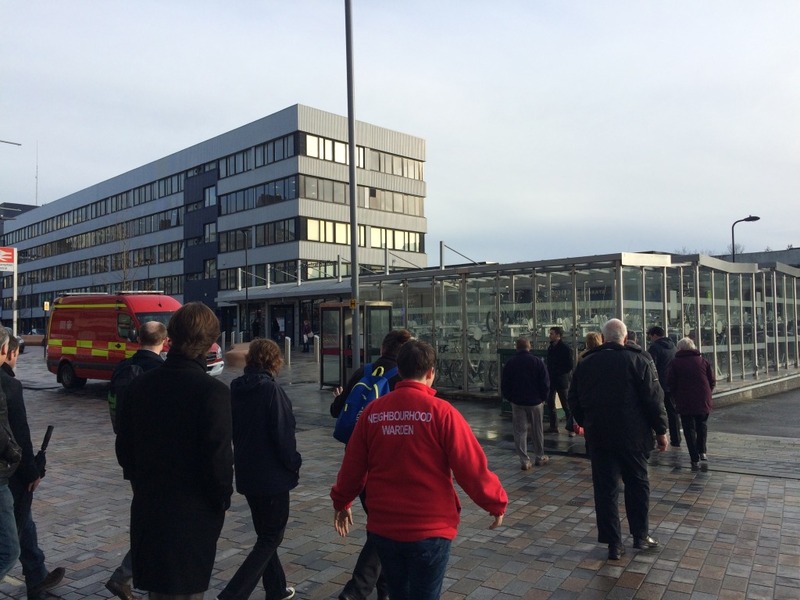 I was invited to attend what was possibly the final Champions Group meeting to review the regeneration work coming to a close at Southampton Station Quarter North. 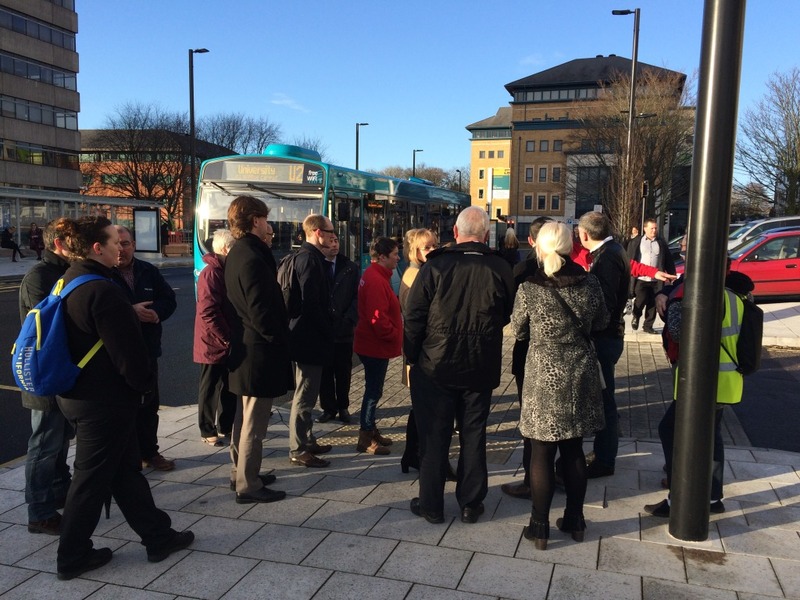 This group of people, representing every walk of life in the local area and community, have been responsible for championing, challenging and keeping the project on its toes since the dawn of the scheme way back in 2012. 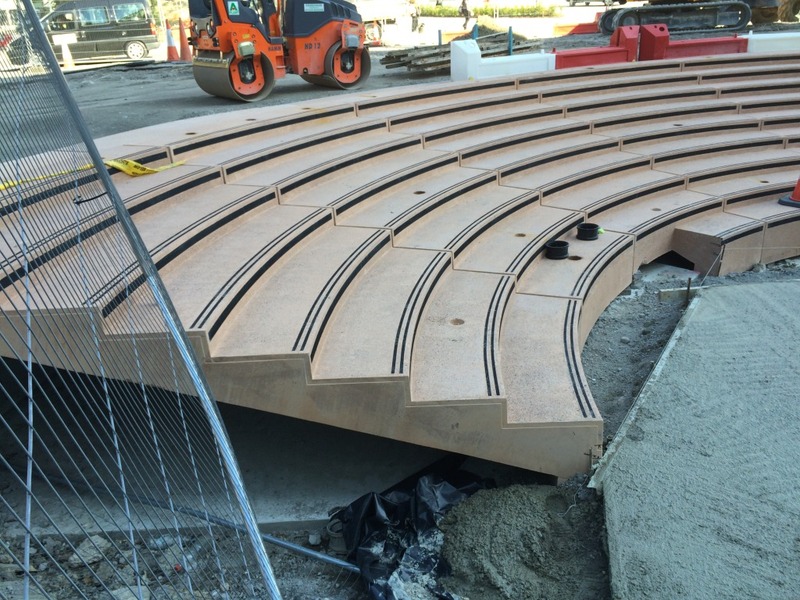 They have been an invaluable part of the project and I hope that they collectively approve of the work done thus far. 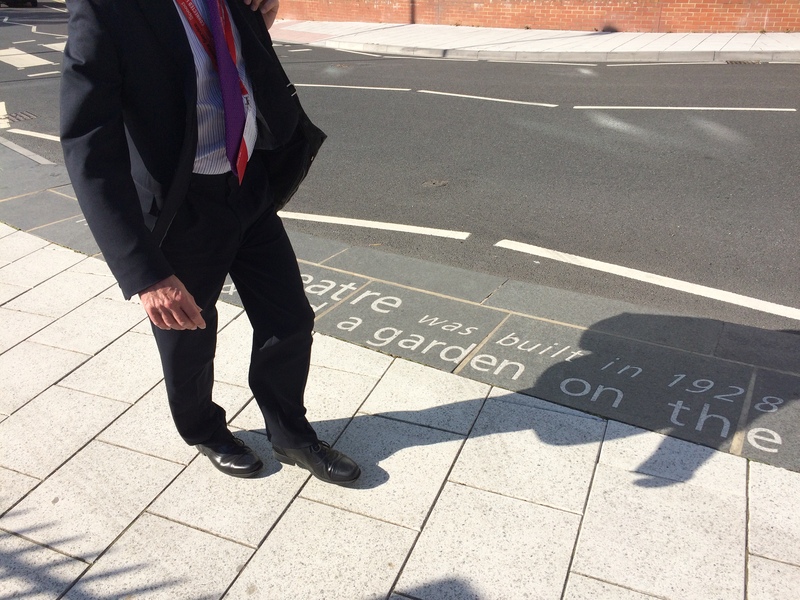 Pete Boustred – Transport Policy and Sustainable Travel Team Leader at Southampton City Council, led the walk around site, assisted by Antony Cutajar, Site Manager for Balfour Beatty Services & Wilson Massie, Stakeholder Engagement for Balfour Beatty Living Places. The last time I had been to site was 28-09-2016 – click this link or scroll down to see this post. 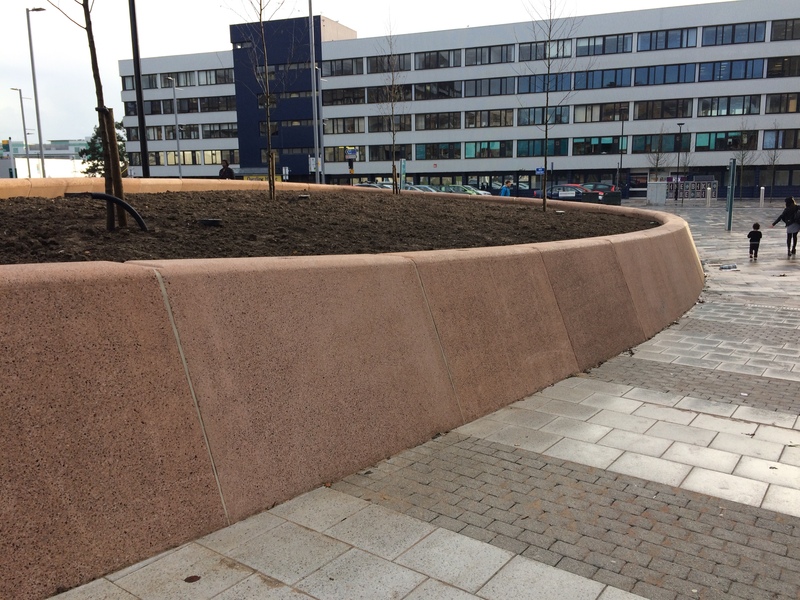 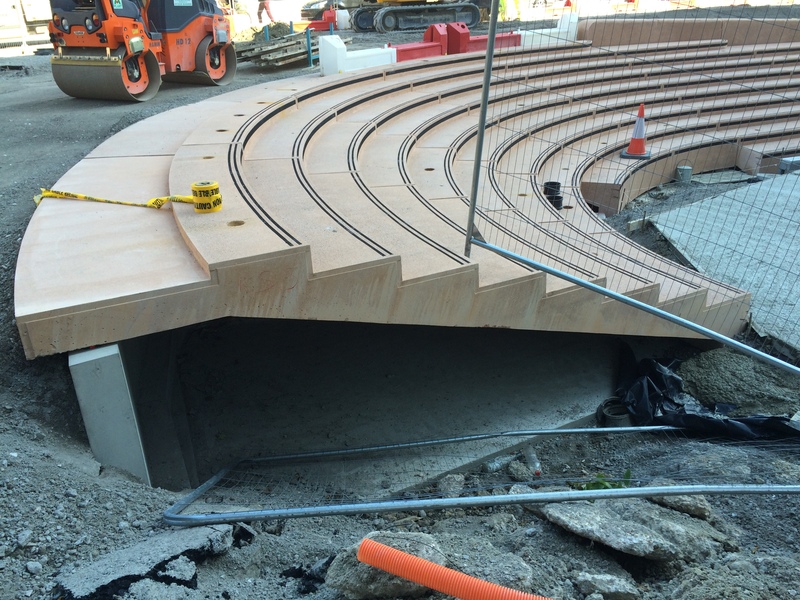 The landscape forms – bespoke cast concrete seating, amphitheatre steps, ramp and retaining walls are now all installed. 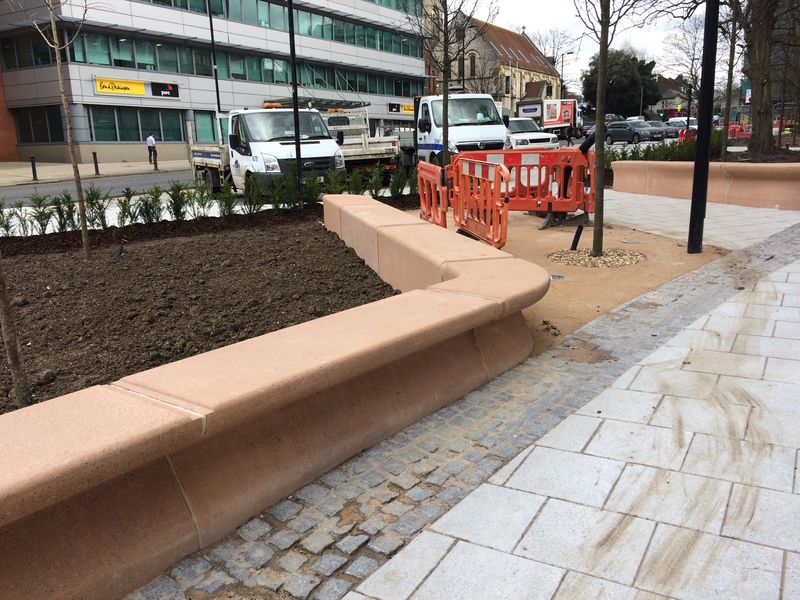 Some snagging was still to be completed and soft landscaping was still in progress. 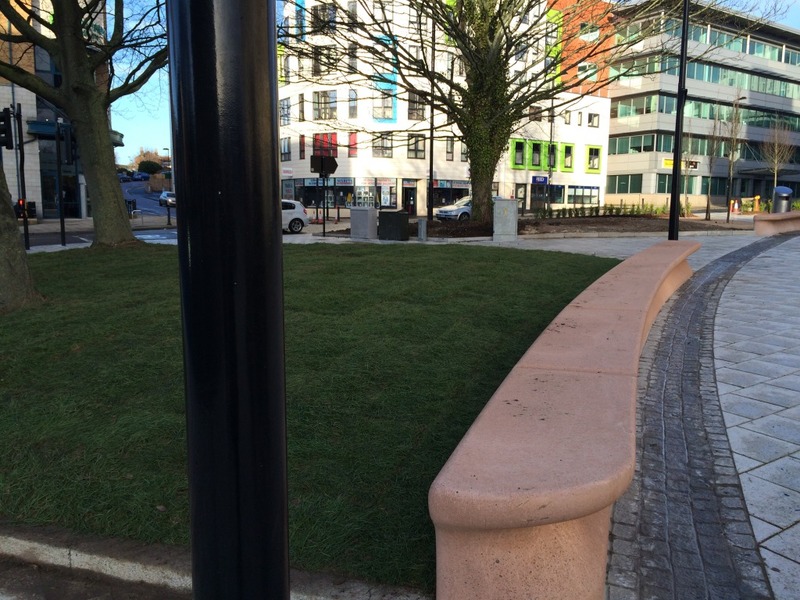 As this was February, there was not much to see in terms of greenery ! 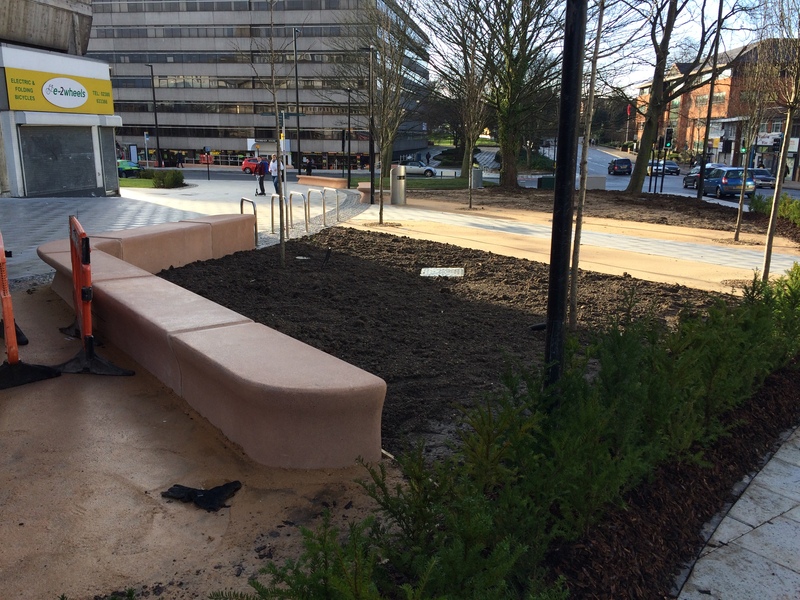 Meadow seed planting has been carried out – & hopefully the impact of this will be seen later in the year. 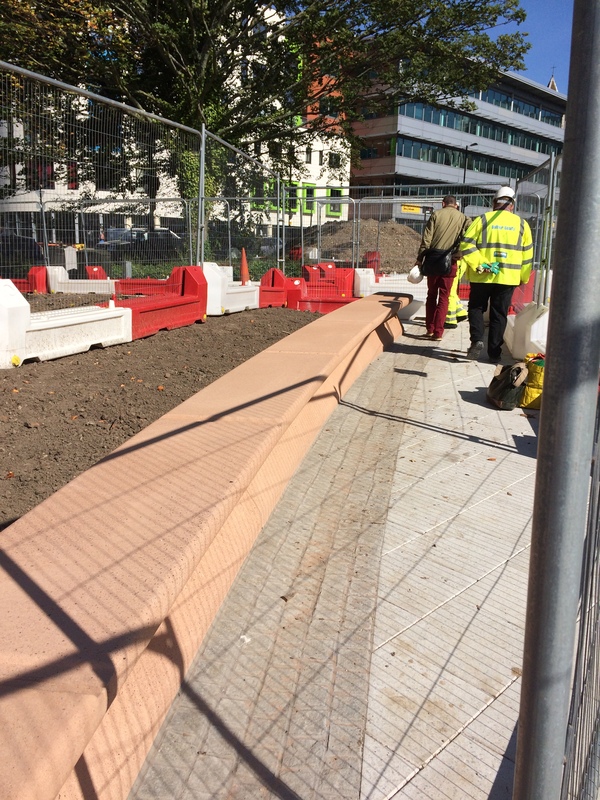 This is a simple photo essay of the walk around the site looking at what has been completed. 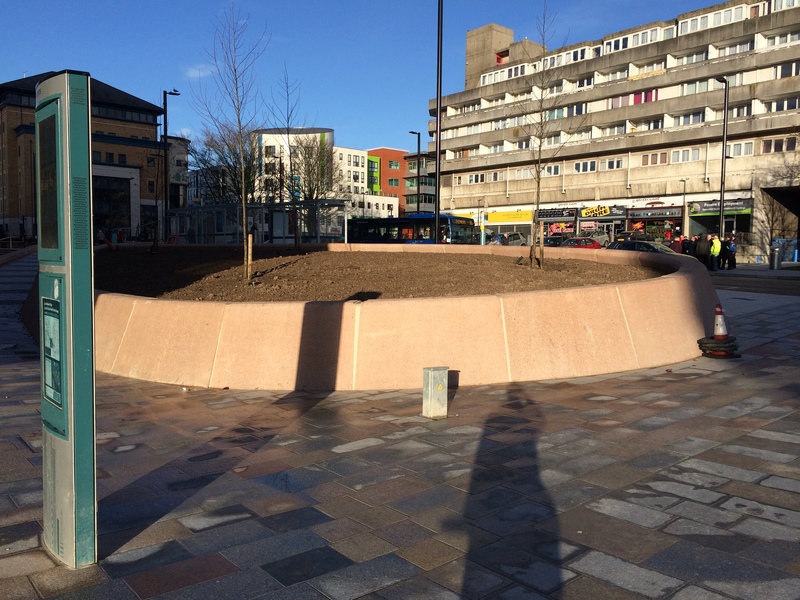 Left: Original site photograph from 2012 by Urban Initiatives. 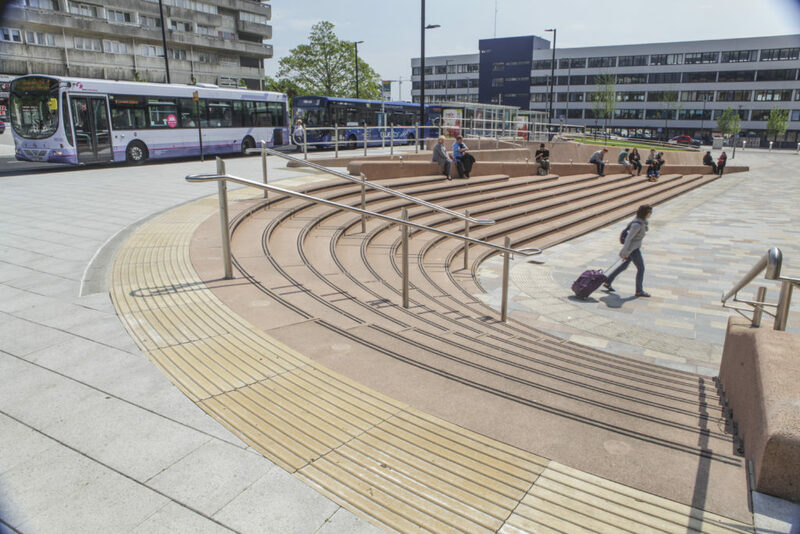 Right: Final Design Proposal by CH2MHill and Christopher Tipping. 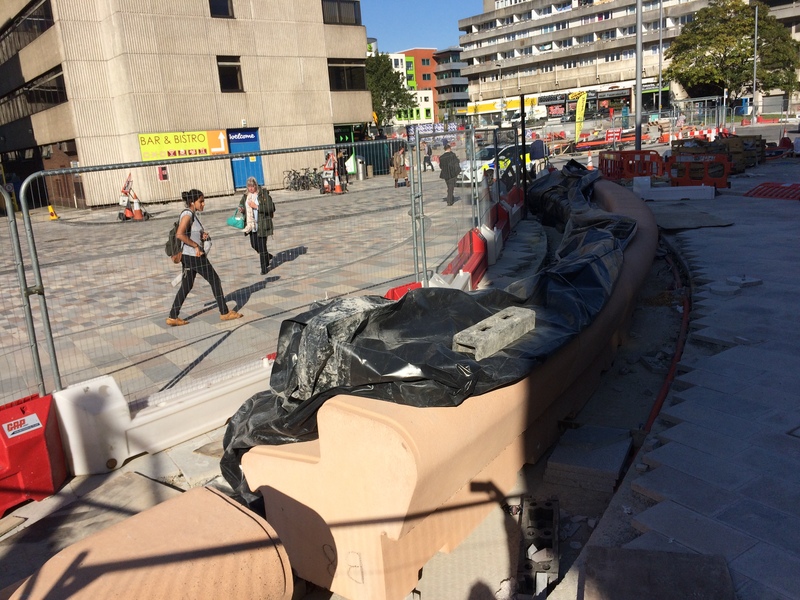 Southampton Station Quarter North Project. 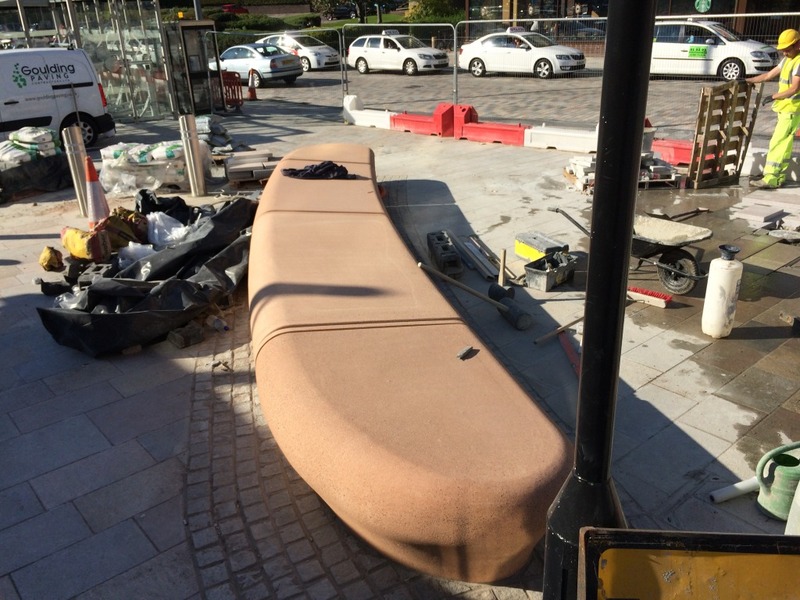 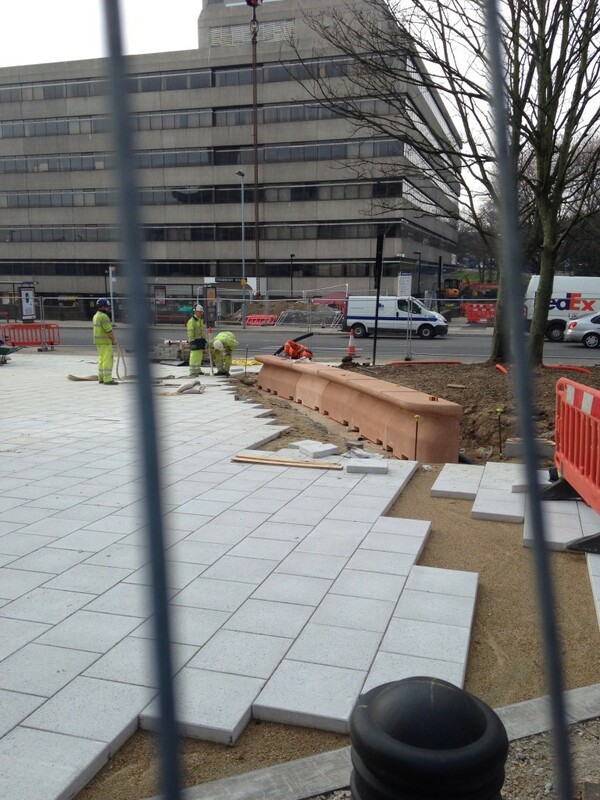 The kerbside artwork ‘Canal Shore‘, which is a vital part of the Station Quarter programme, is very nearly completed. 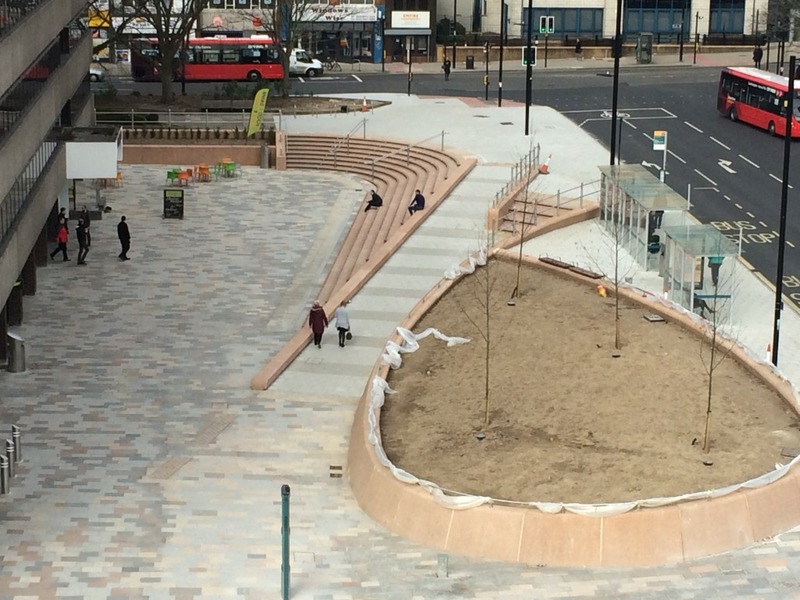 Only a short section remains to be finished, once the Station Forecourt area is completed. 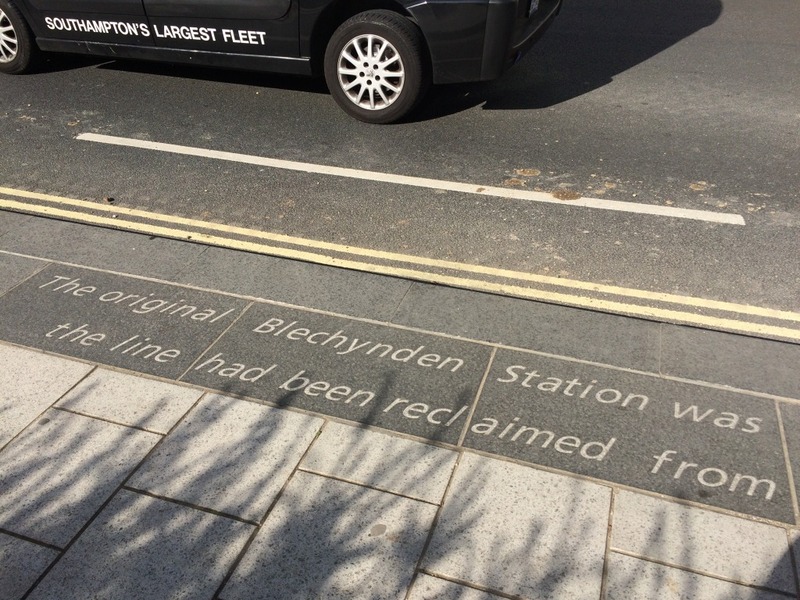 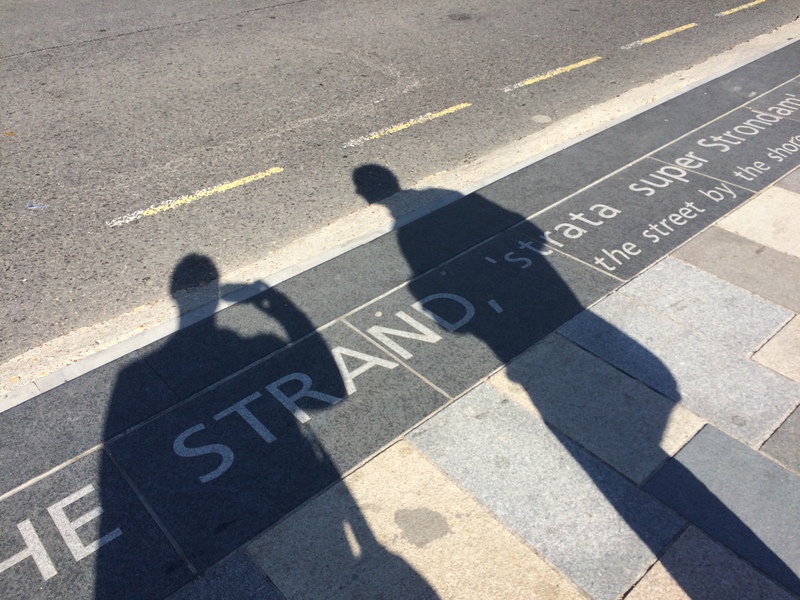 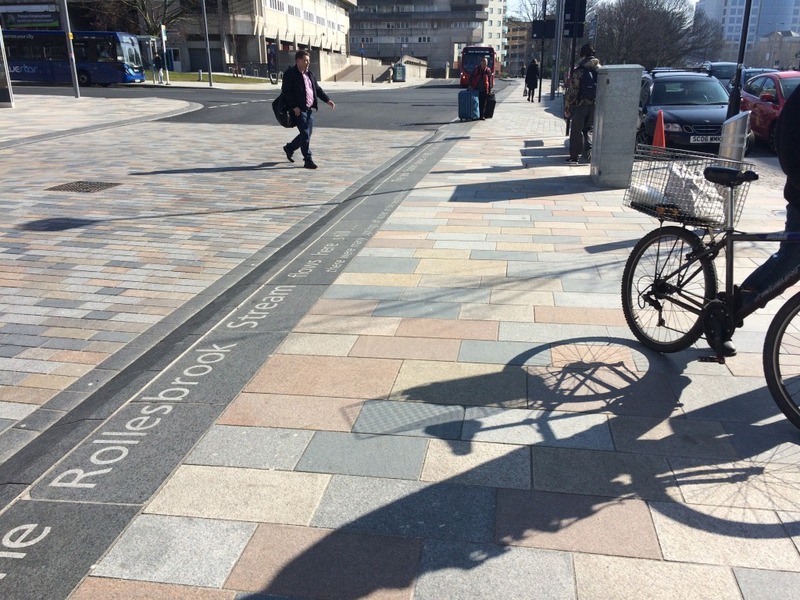 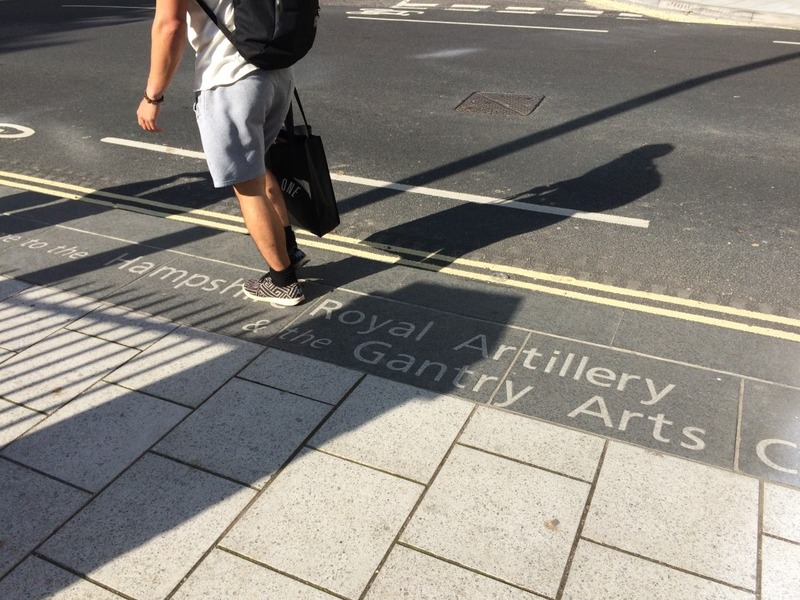 ‘Canal Shore’ is a 205m long black basalt kerb with inset granite text, which traces the route of the former Southampton to Salisbury Canal and also happens to be the line of the historic shoreline of the River Test Estuary. 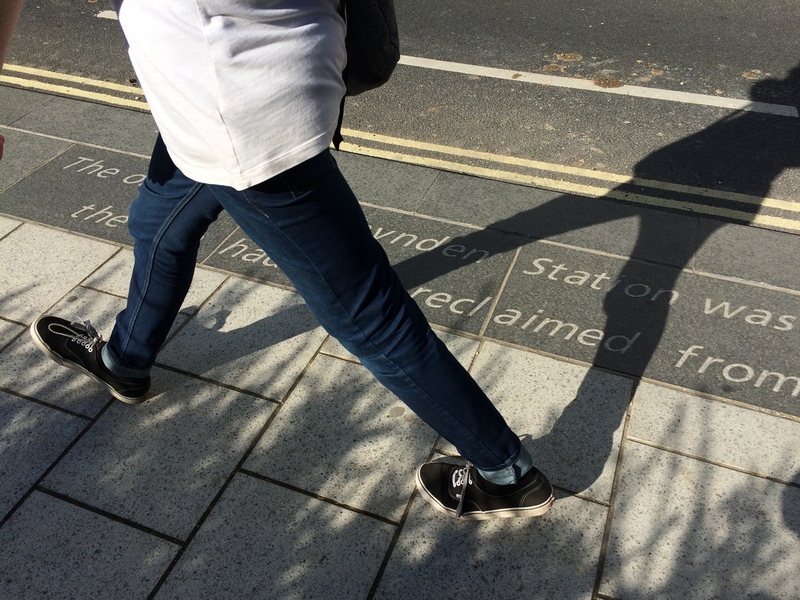 The narrative refers to places, people and events which have marked the development of this landscape. 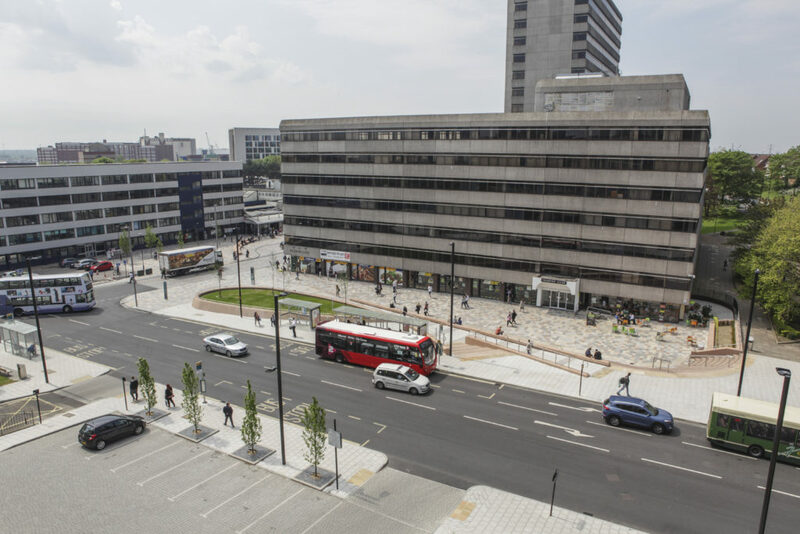 Importantly, the work is also a strategic part of the wayfinding and placemaking ambitions for the Station Quarter project, as it makes an emphatic statement along the main east to west pedestrian route to the Station from the Above Bar area of the city and the Cultural Quarter. I met up on site with Simon Taylor – Urban Design Manager, Balfour Beatty Living Places and Pete Boustred – Transport Policy & Sustainable Travel Team Leader at Southampton City Council. 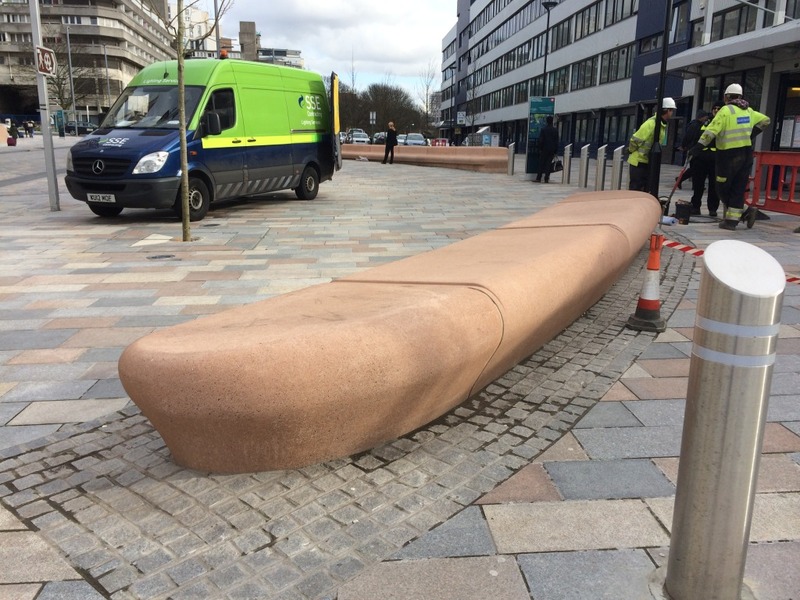 I was first commissioned to work on the interpretive and site responsive elements of the project by Simon at BBLP in 2012. 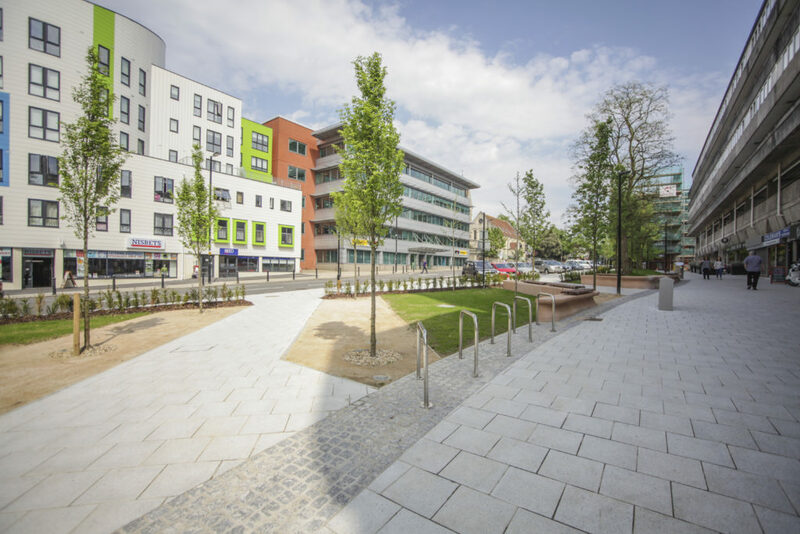 We have worked together several times previously in the City. 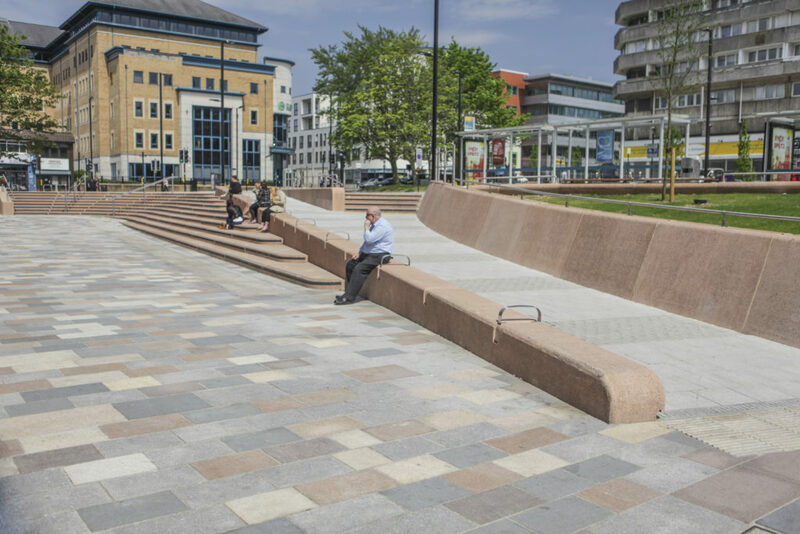 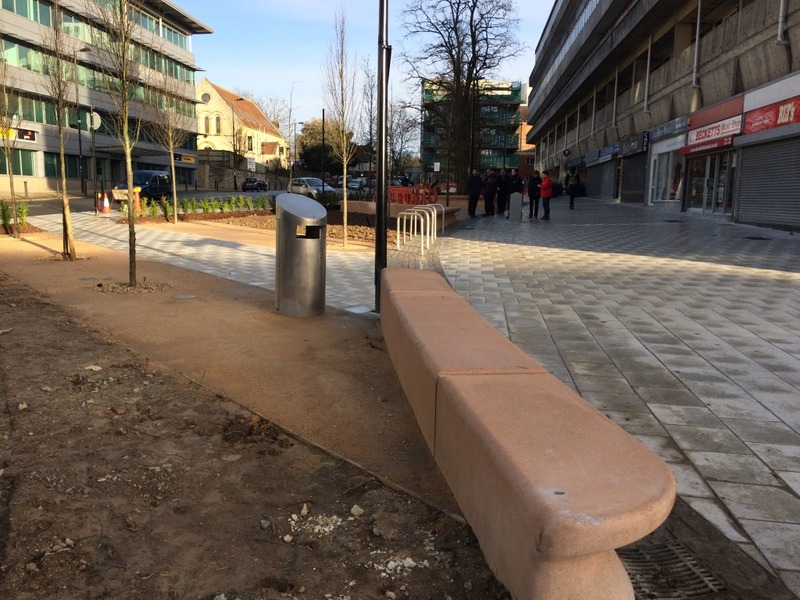 BBLP are delivering the project for Southampton City Council. 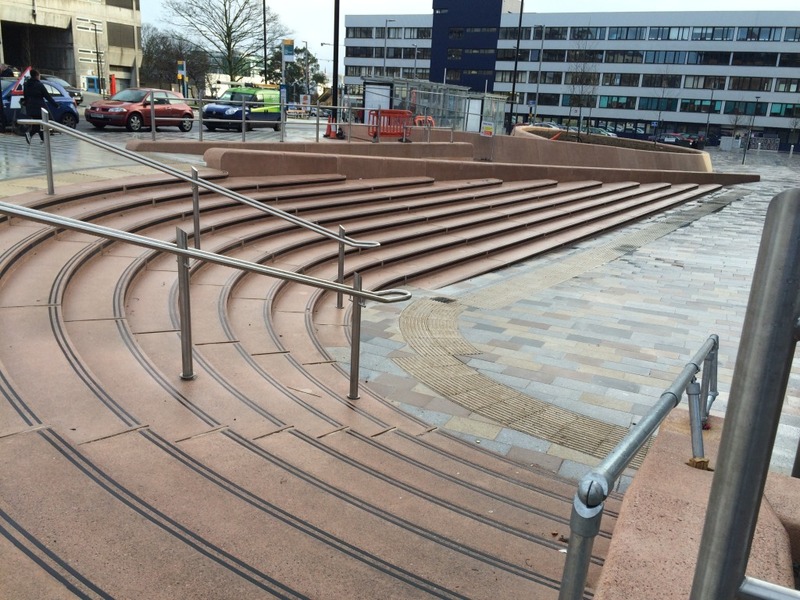 Massive changes since my last visit if you look at earlier posts, but brilliant to see the project coming together so well. 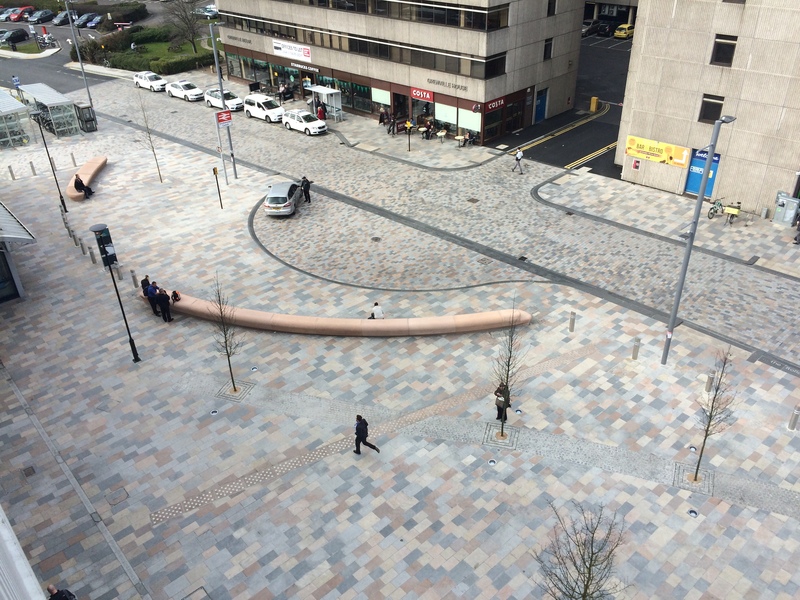 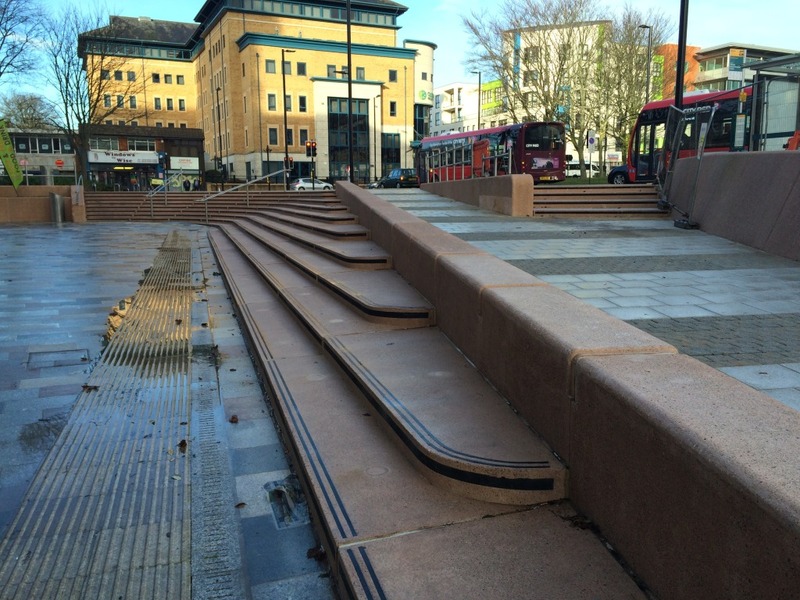 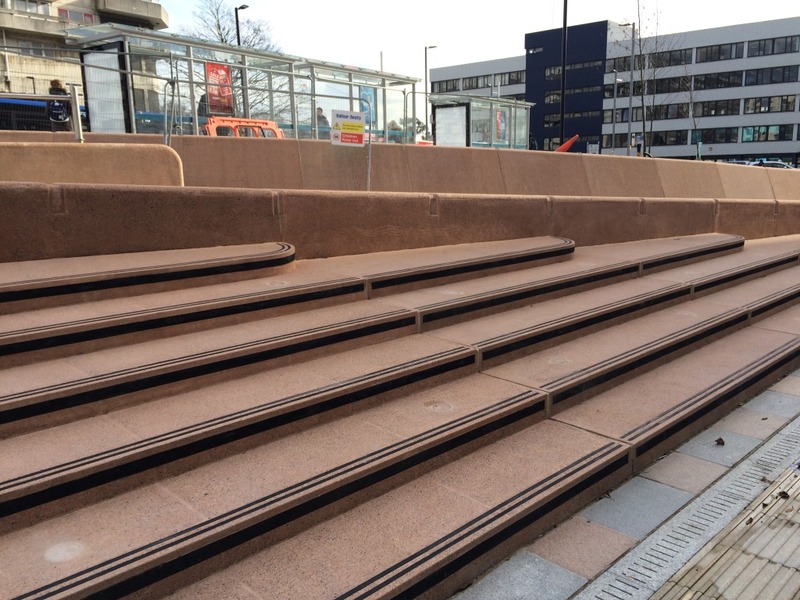 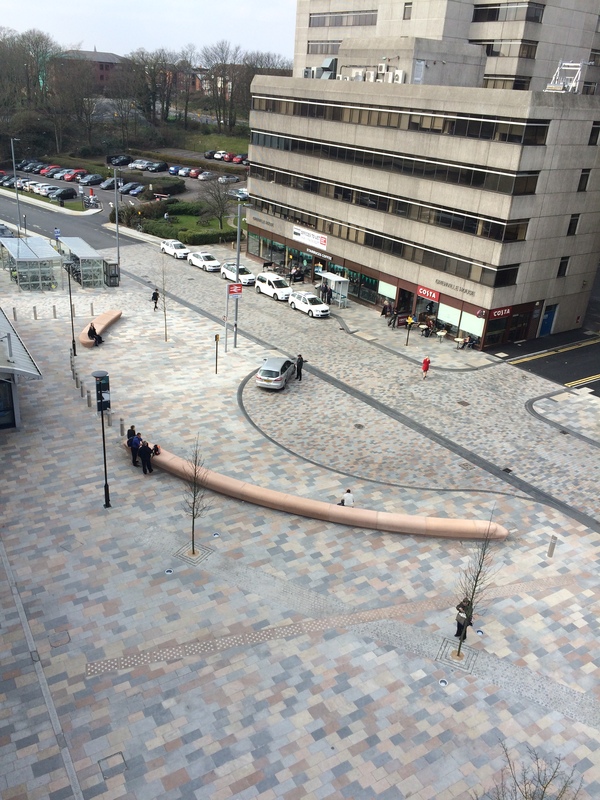 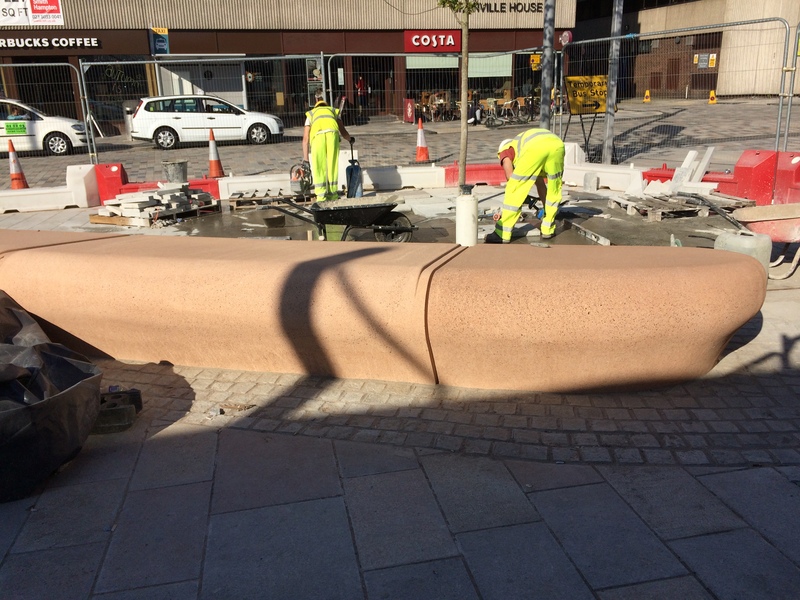 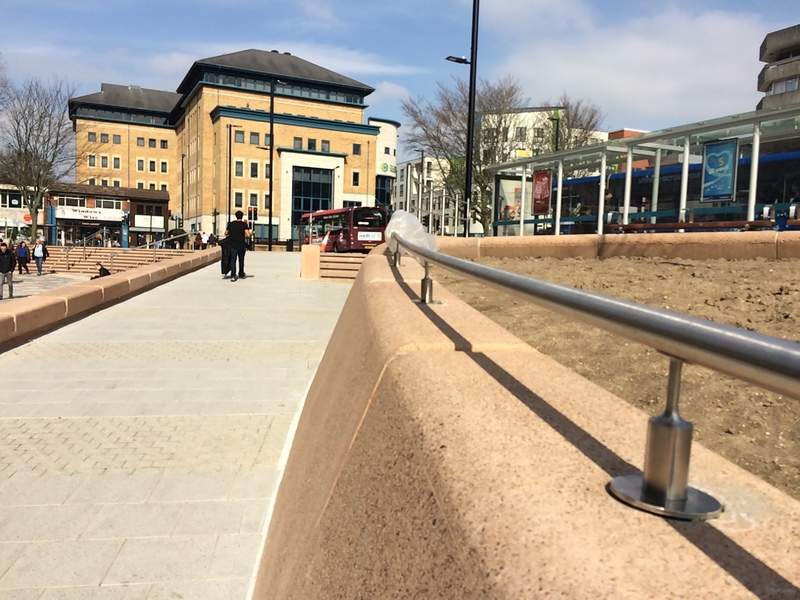 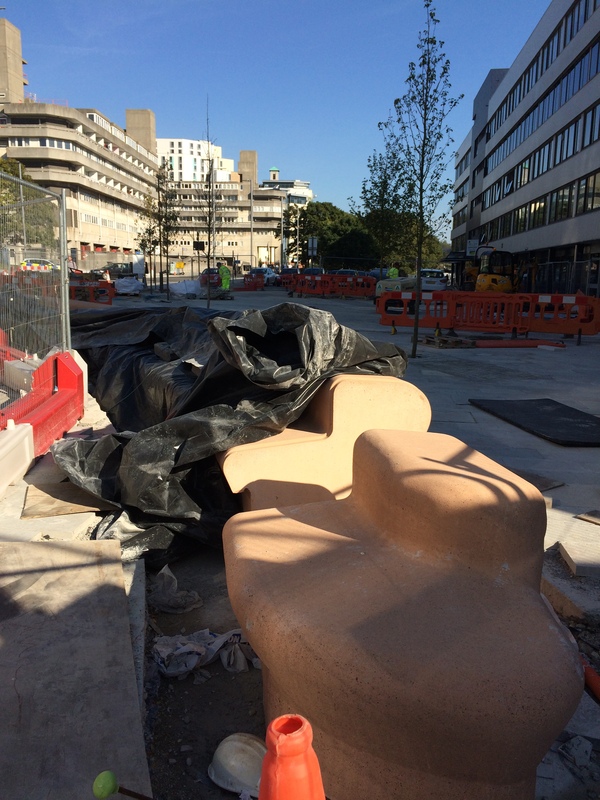 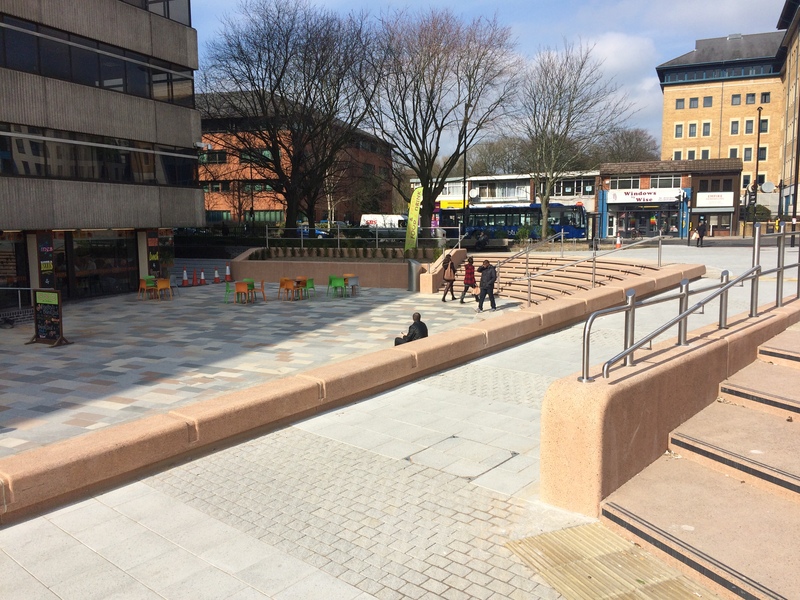 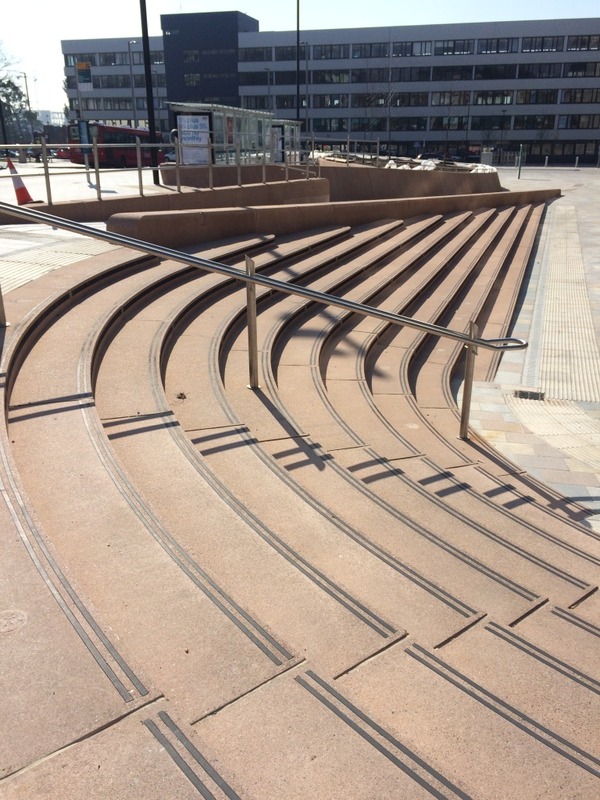 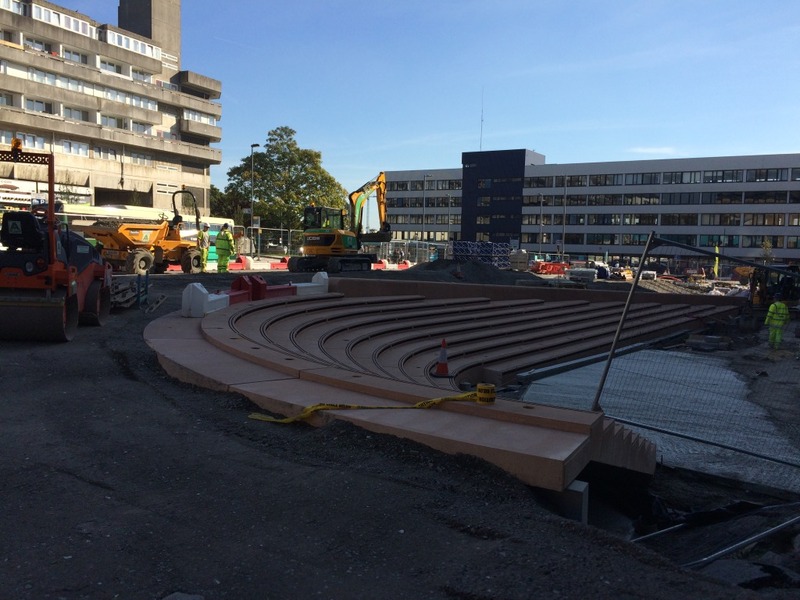 The amphitheatre steps, part of the Phase 2 works on Wyndham Place have arrived and have been lifted into place. 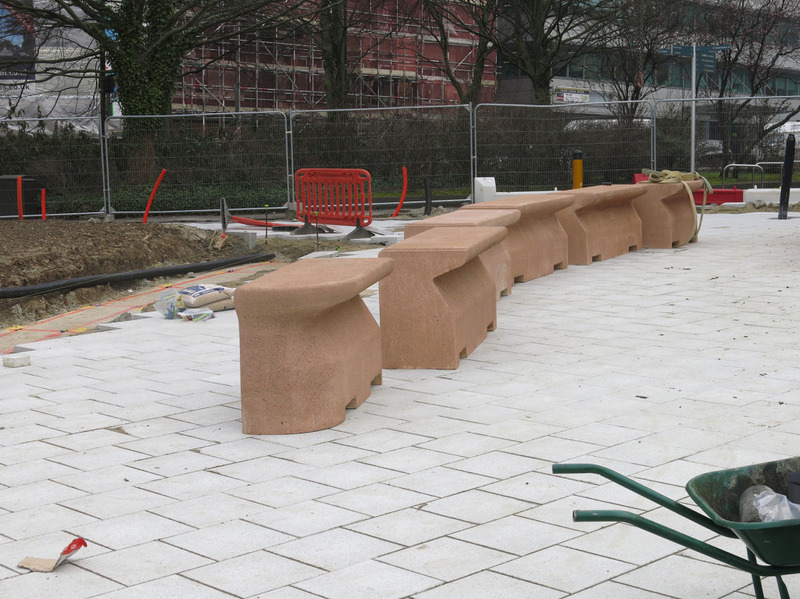 There are a number of other structures still with the manufacturer and these are expected to arrive over the coming weeks. 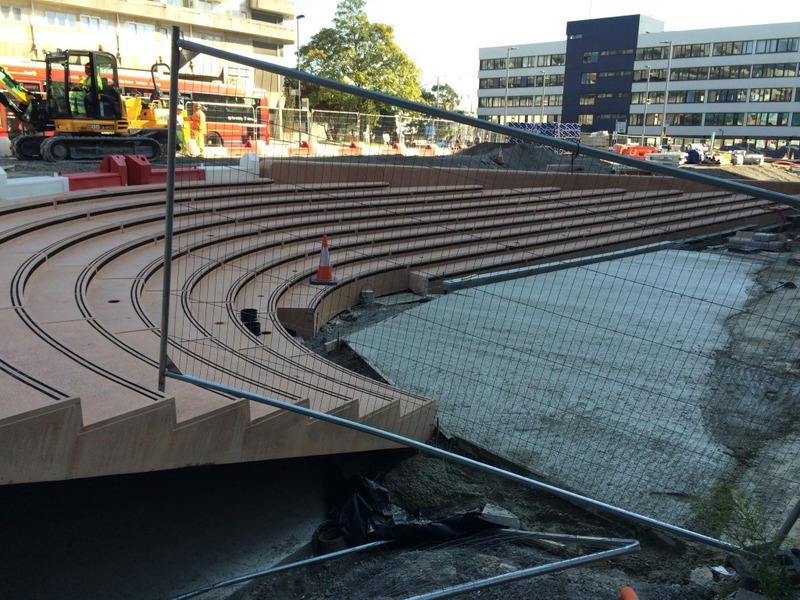 The installation of the large-scale bespoke cast concrete benches, amphitheatre steps and retaining structures manufactured by CCP will continue over the coming weeks. 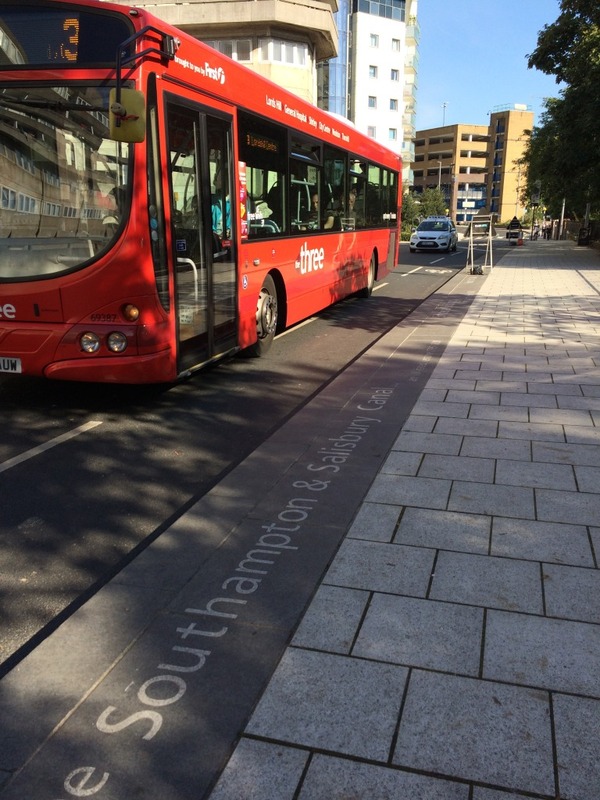 Hopefully I will get down to Southampton again soon to record more progress. 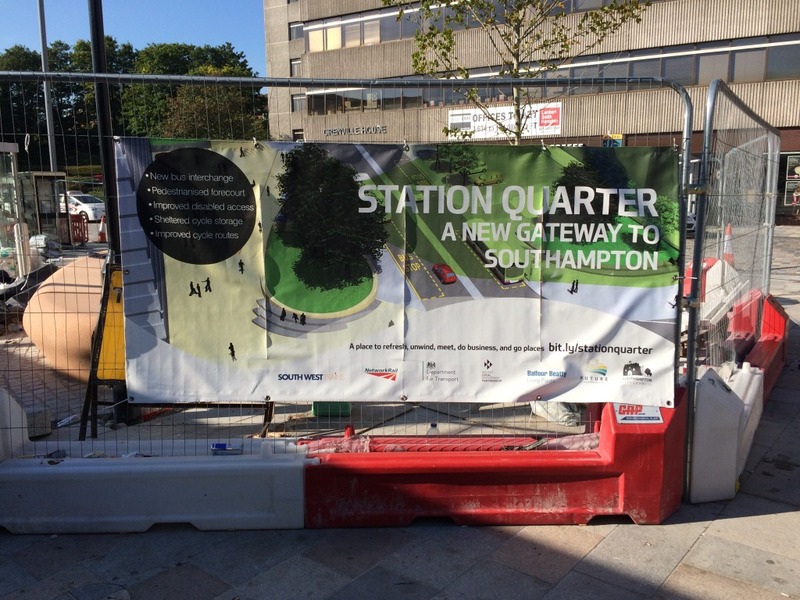 Station Quarter North, Southampton. 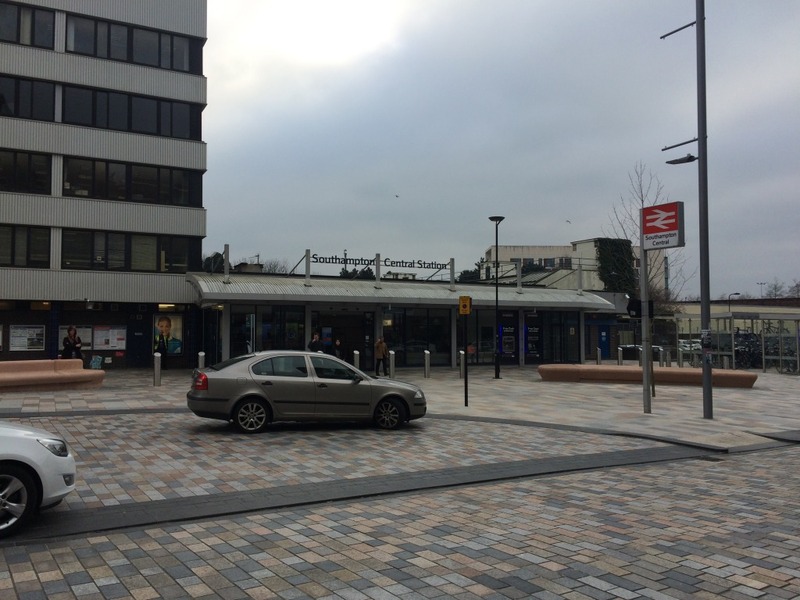 The view on exiting the Station. 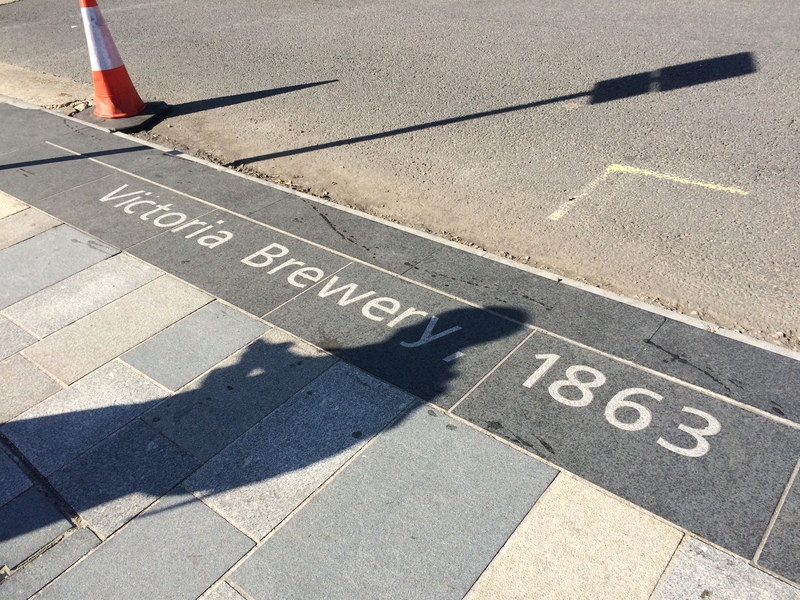 What was a real pain was that although it was a brilliant blue day – this part of the site was in deep shadow, so the images are a bit too dark to do the work justice ! 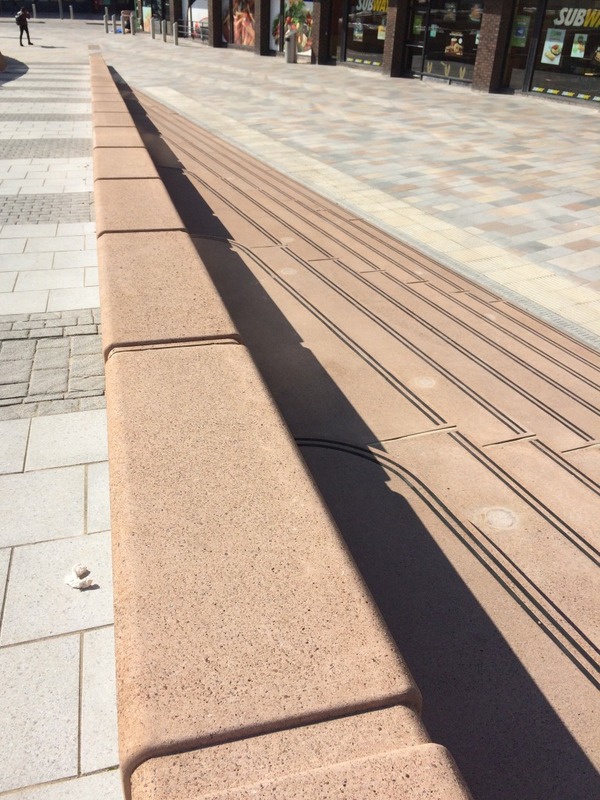 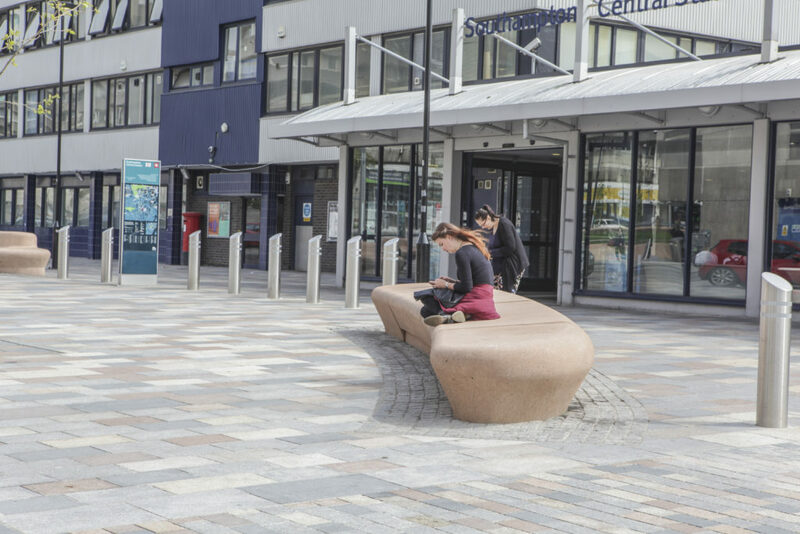 These benches are on the Station Forecourt, immediately as you enter or exit the Station building. 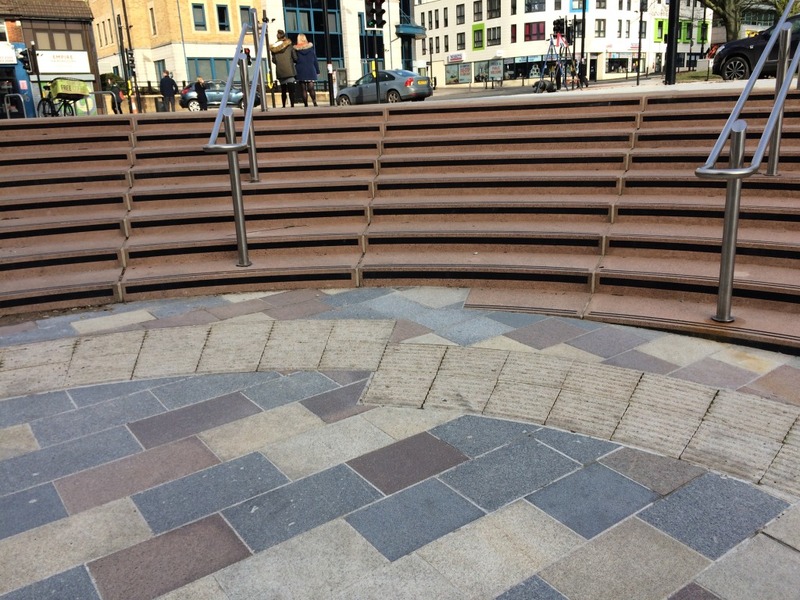 This is one section of a large curving two tier bench and way-finding feature within the scheme. 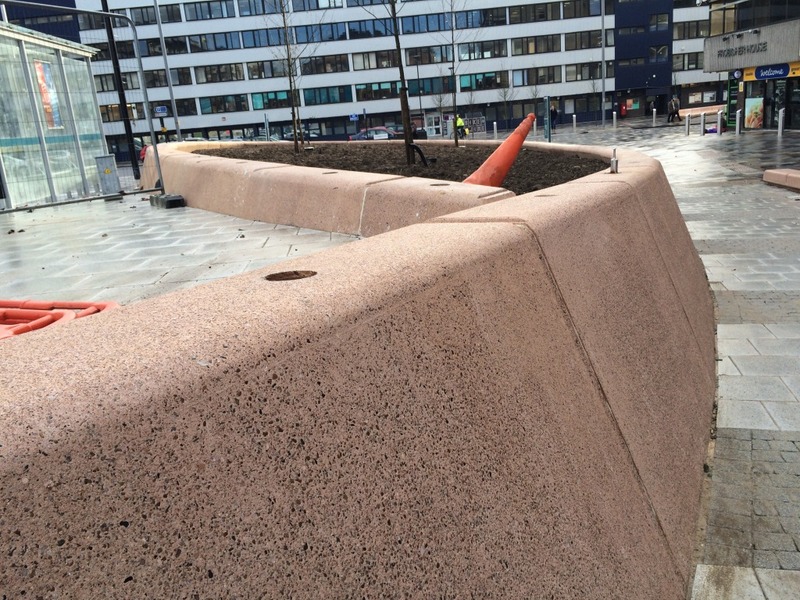 This week saw the delivery and installation of the first bespoke cast concrete units to site. Wilson Massie of Balfour Beatty Living Places has let me use his images taken during the works to install. 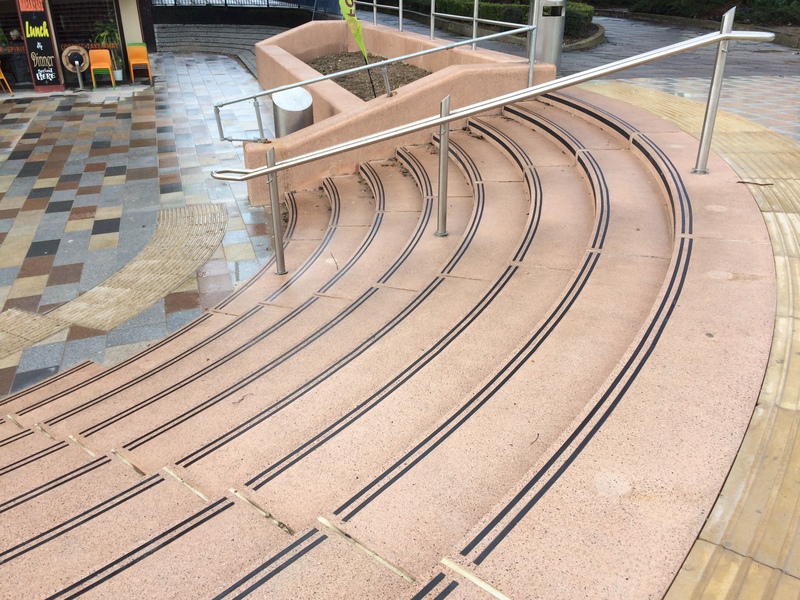 Balfour Beatty Services are delivering and installing all the project on site. 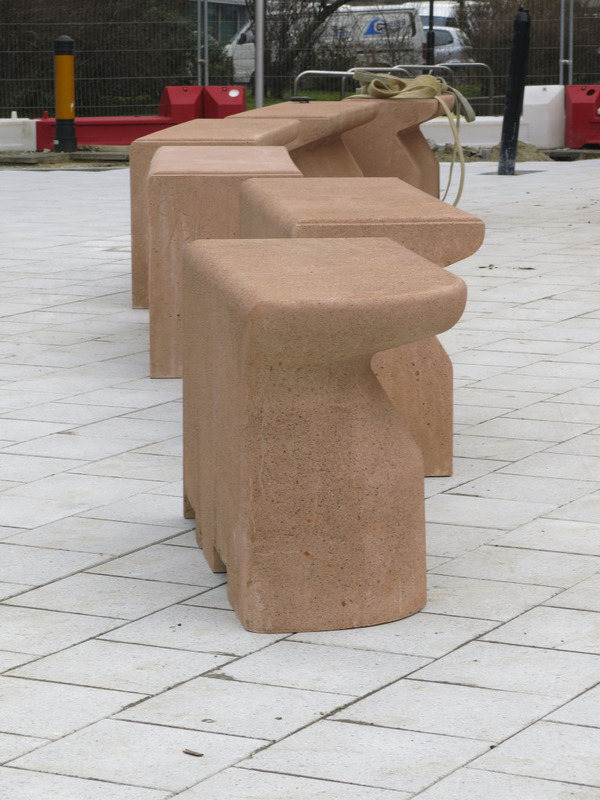 The units are manufactured by CCP Ltd – Cornish Concrete Products, nr Truro. 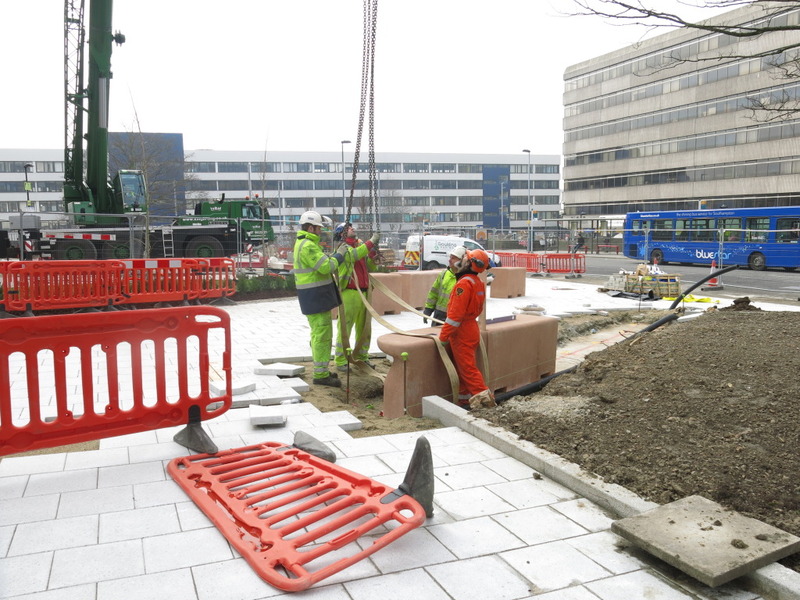 Yesterday, Tuesday 17th March saw the first of the Type C cast benches arrive on site to be crane-lifted into place at Station Quarter North. 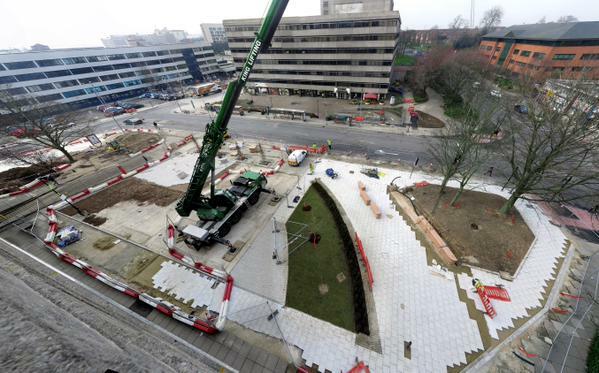 Balfour Beatty Living Places – Services Division are doing a great job in regard to the installation and delivery of the whole project on site. 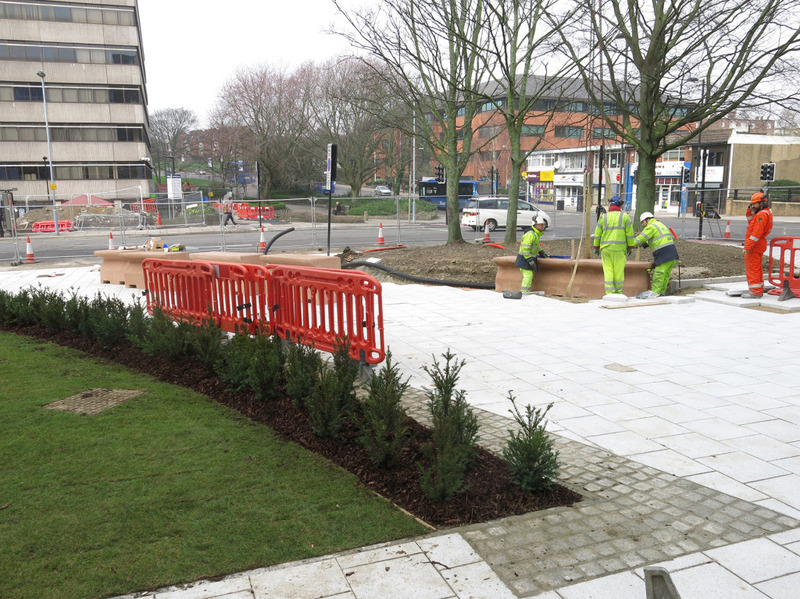 ‘Outside Wyndham Court a great deal of the footpath and landscaping is down and this gives a glimpse of how the scheme is going to look. 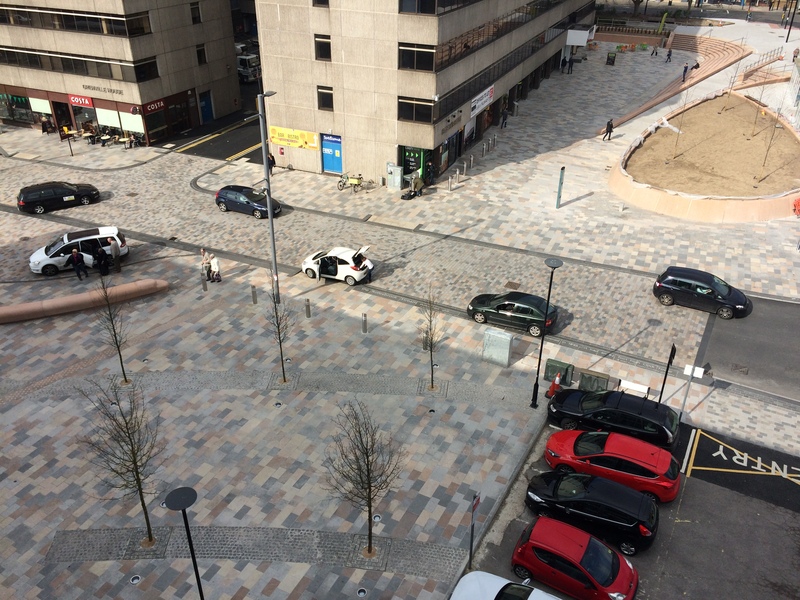 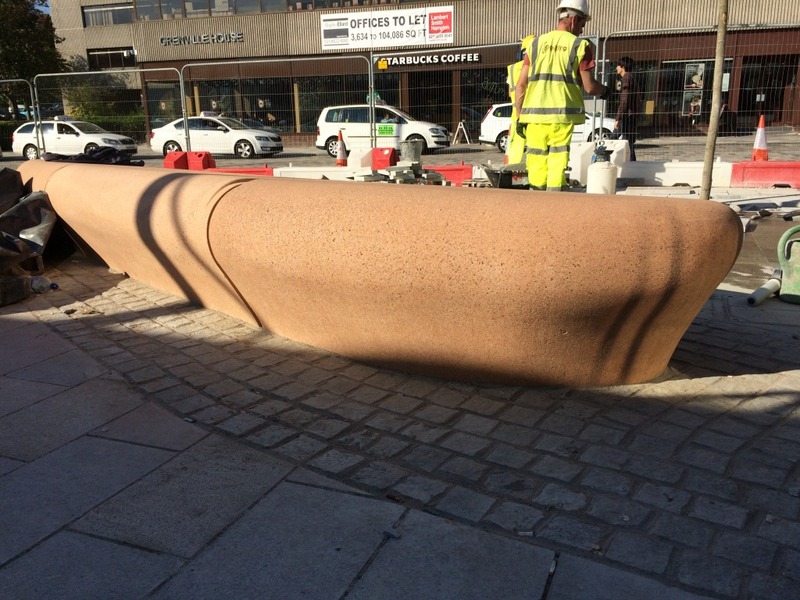 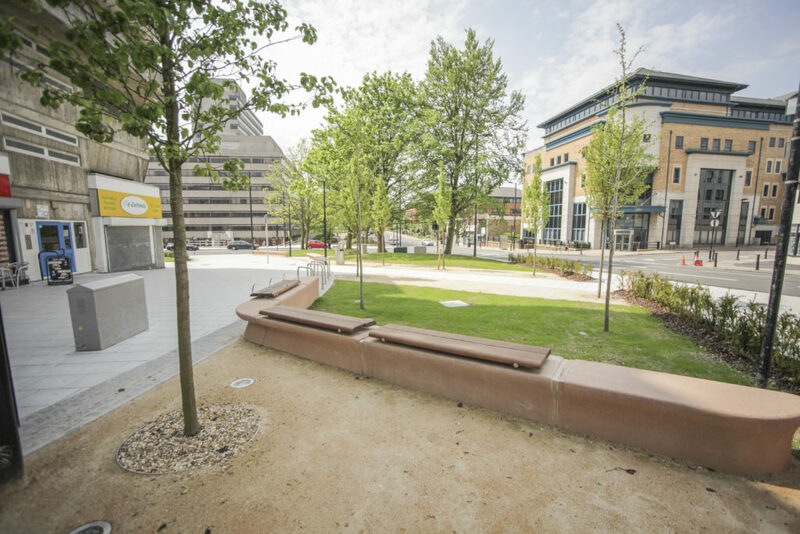 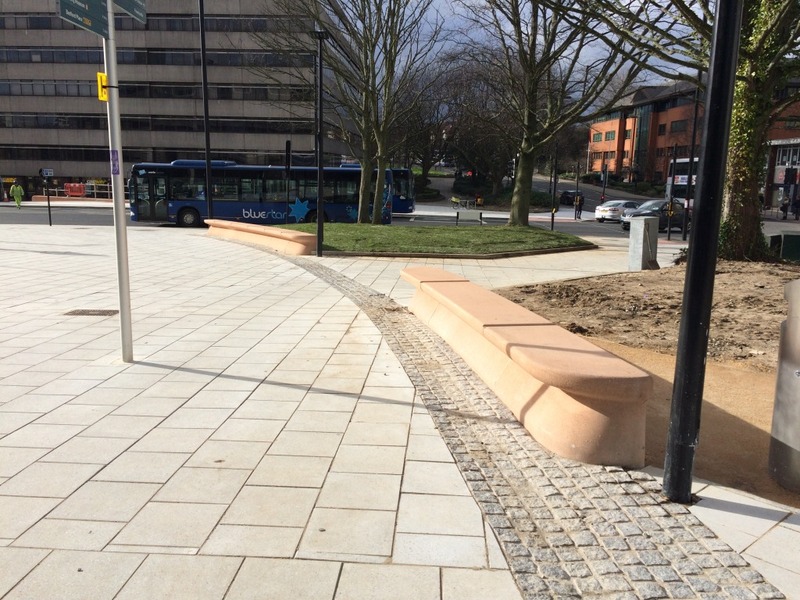 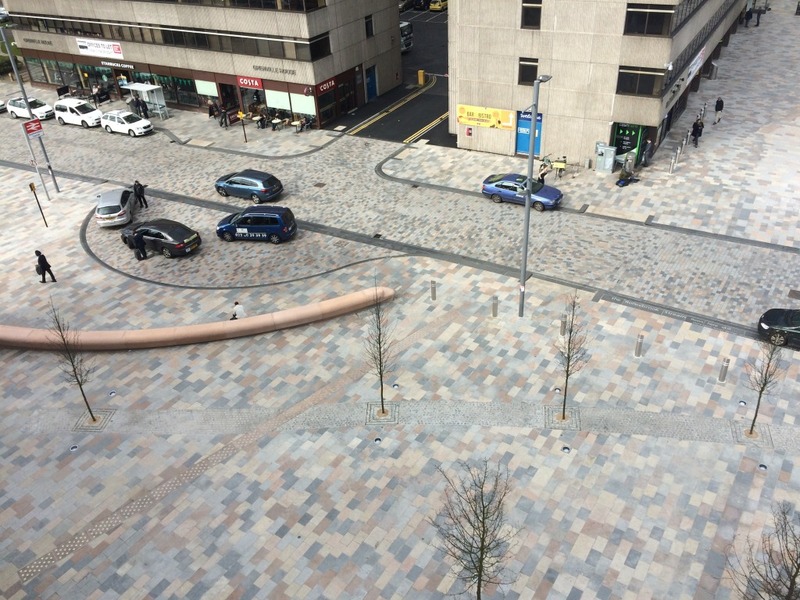 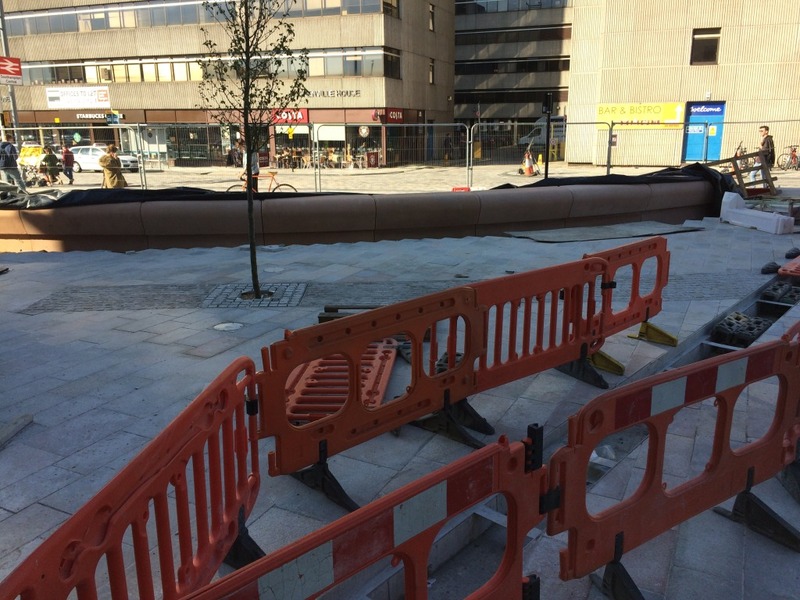 Block paving of the public car park has started, trees are in and yesterday the first of the new bespoke stone benches was crane lifted into place.’ Taken from the Southampton Station Quarter update bulletin, 18th March 2015, Balfour Beatty Living Places. Wyndham Place as seen from Wyndham Court showing Southampton Central Station Quarter Regeneration project. 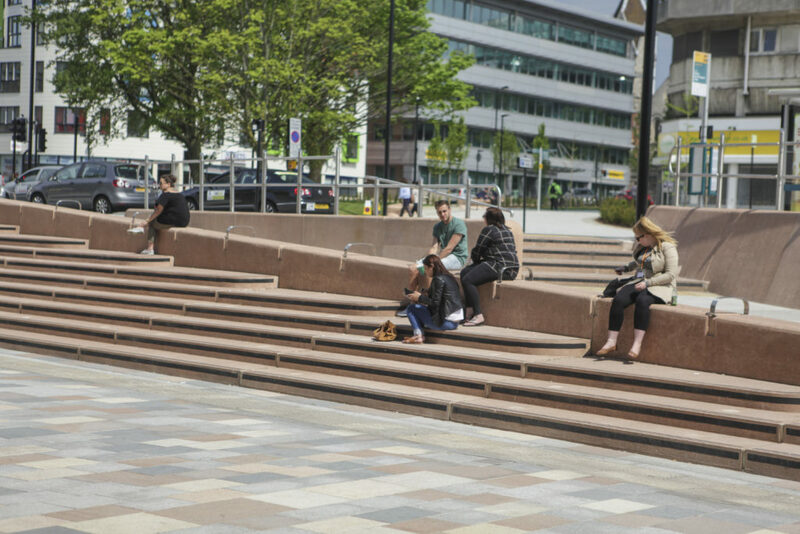 Image: Wilson Massie, Balfour Beatty Living Places. 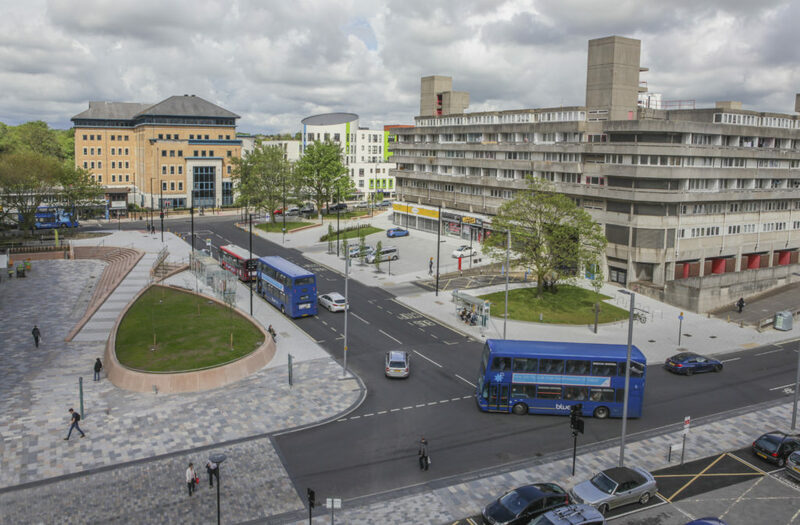 Wyndham Place, Southampton seen from Commercial Road looking west showing Southampton Central Station Quarter Regeneration project. 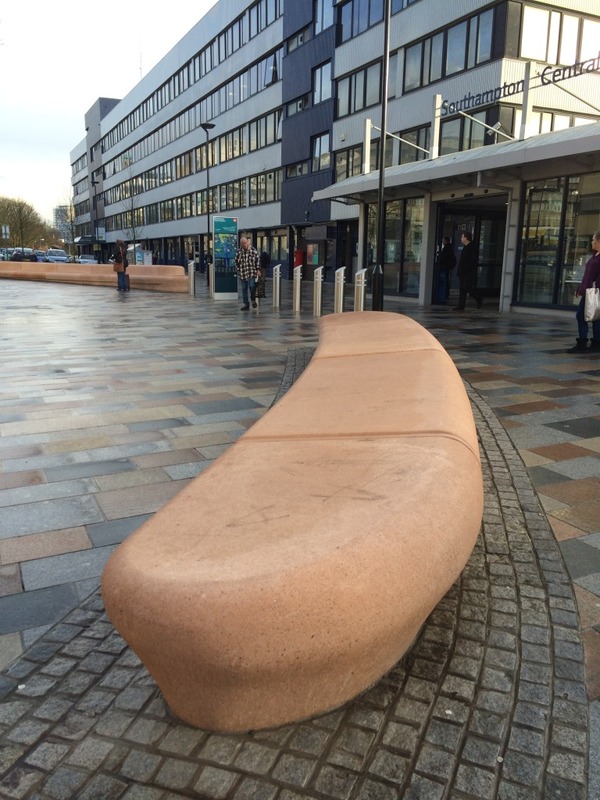 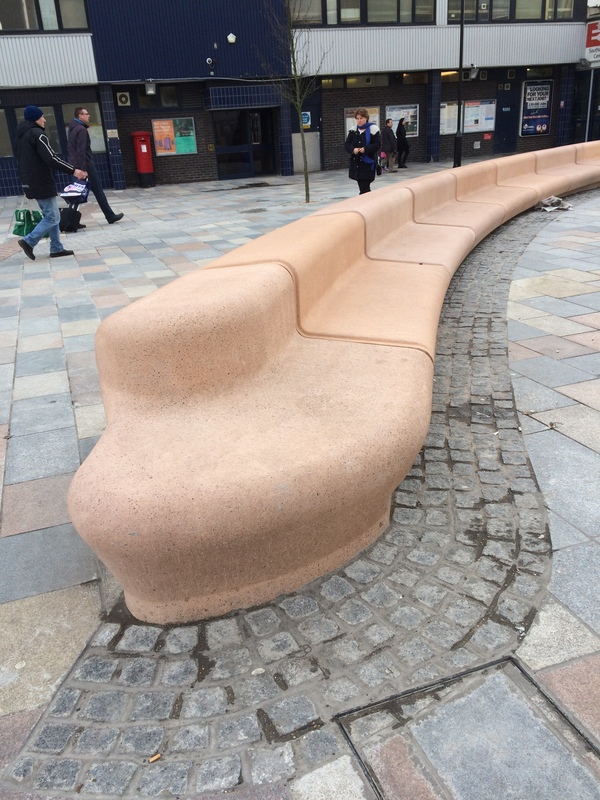 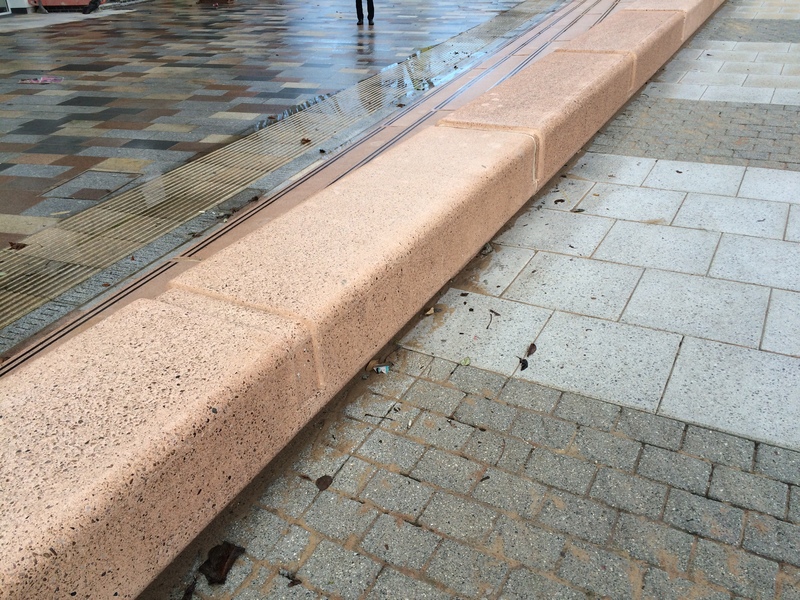 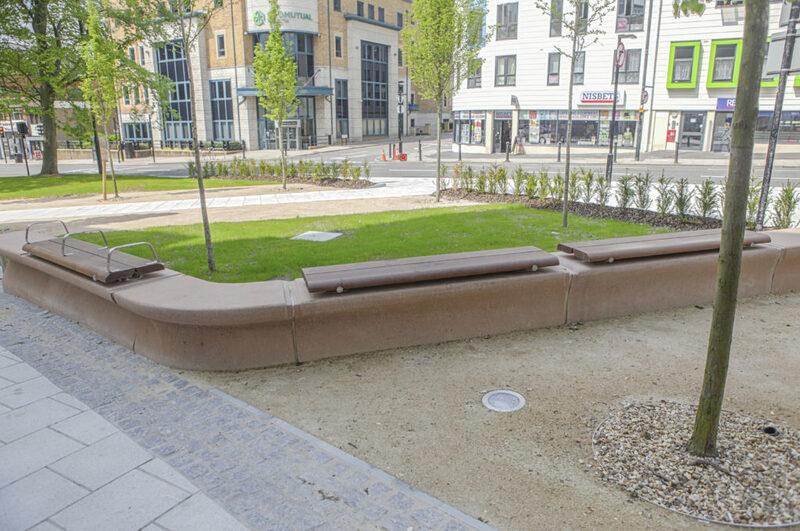 Bespoke Cast Concrete benches during installation. 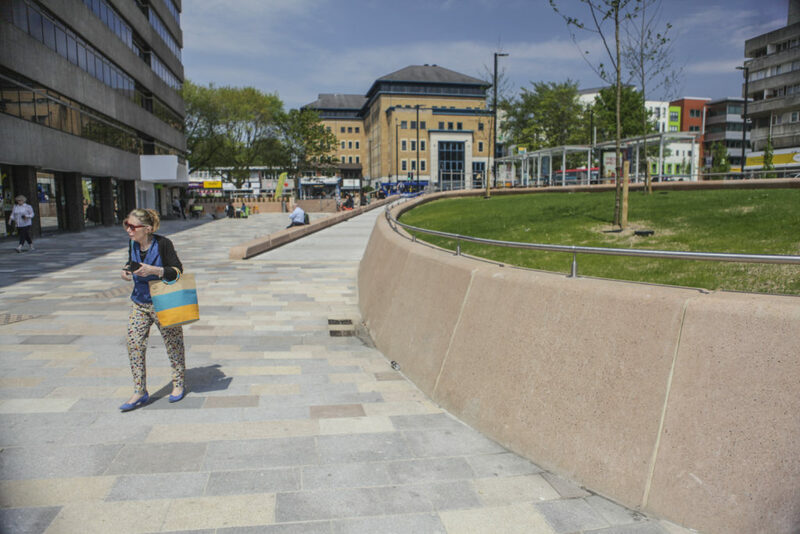 Image: Matt Dyer, Senior Project Engineer, Balfour Beatty Living Places – Services Division. 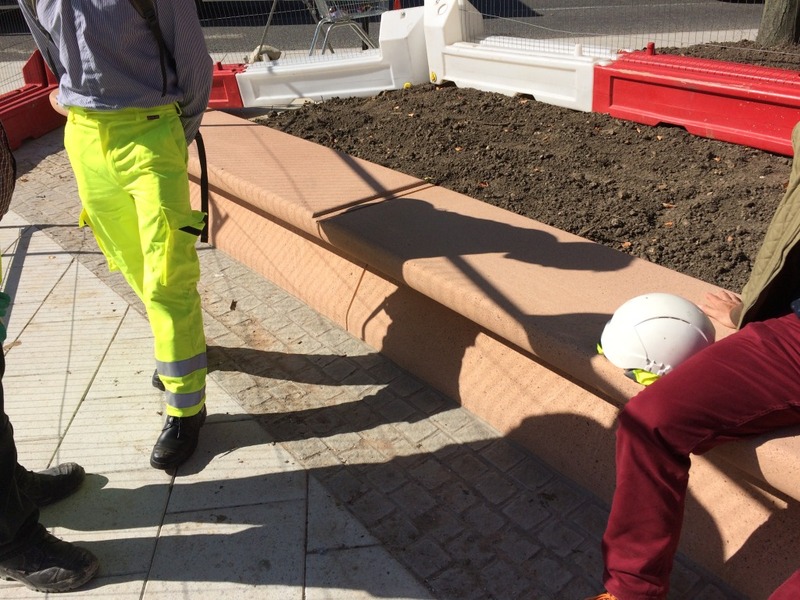 Bespoke benches during installation. 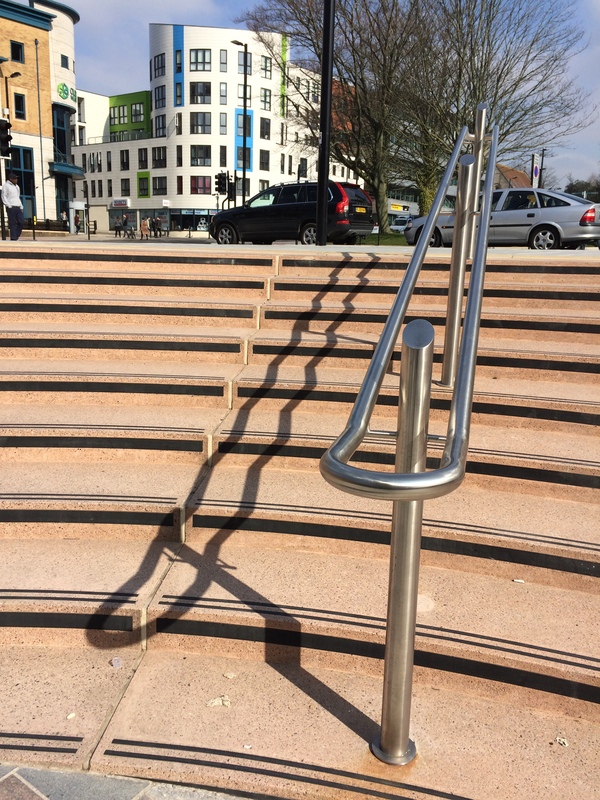 Unfortunately, one of the 6 units has a lighter finish than the others. 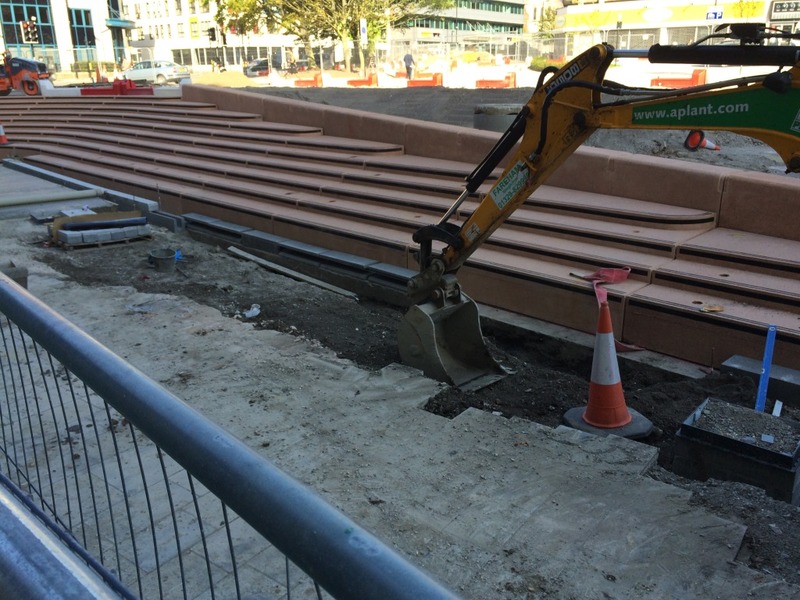 This can be remedied post installation on site by the manufacturer CPP Ltd.